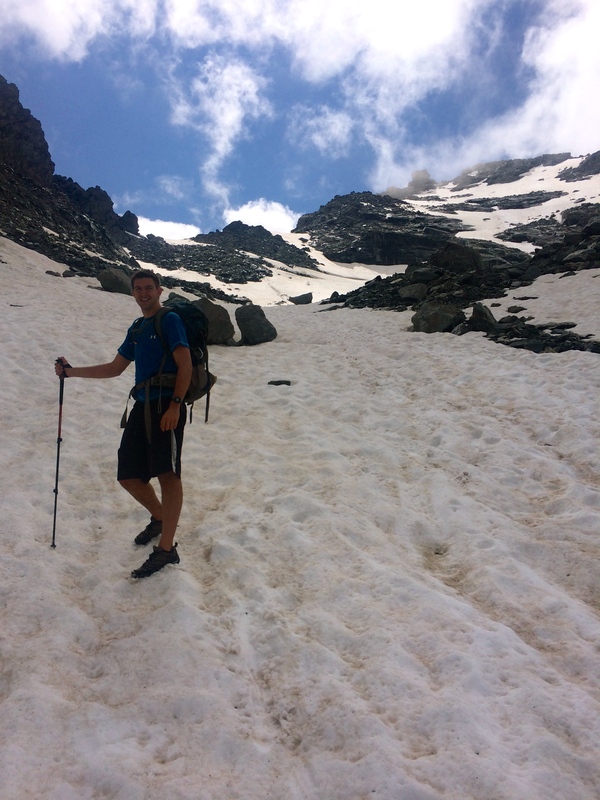 The summer of 2013 came to a close with one more trek up a Rocky Mountain 14er. Our goal for the morning was scrambling up Crestone Needle in the Sangre de Christo Mountains of Colorado. While star gazing the night before the hike, bundled in sleeping bags, three friends contemplated the next year and future adventures. Ben would be concluding a year in Germany and Matt and I would be finishing up our first year post grad. 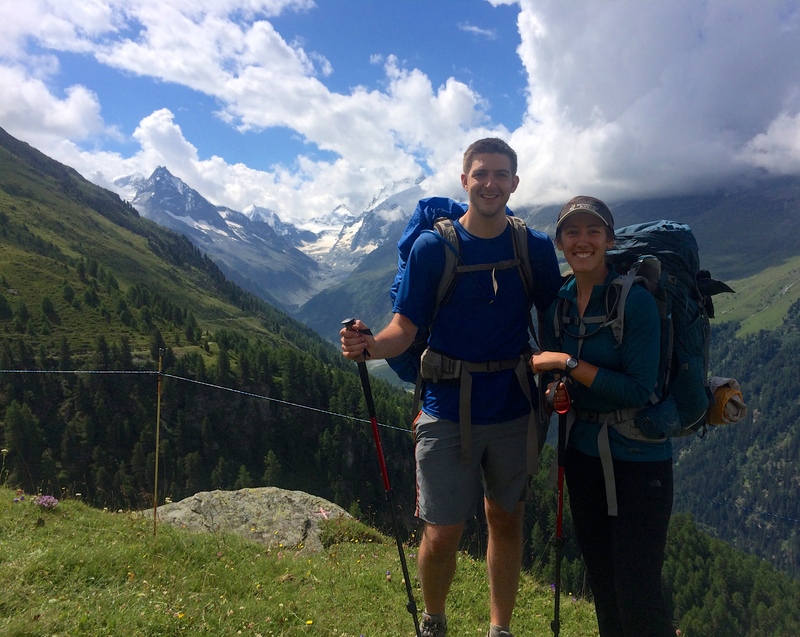 “Let’s go hiking in the Alps.” A wishful thought, but the dream was set as we went our separate ways after a successful hike the next day. We spent the winter brainstorming and tossing around our starry-eyed plan, and as we boiled down the date in August, Matt unfortunately had to drop out. Ben and I were determined so we put pen to the paper and started planning. 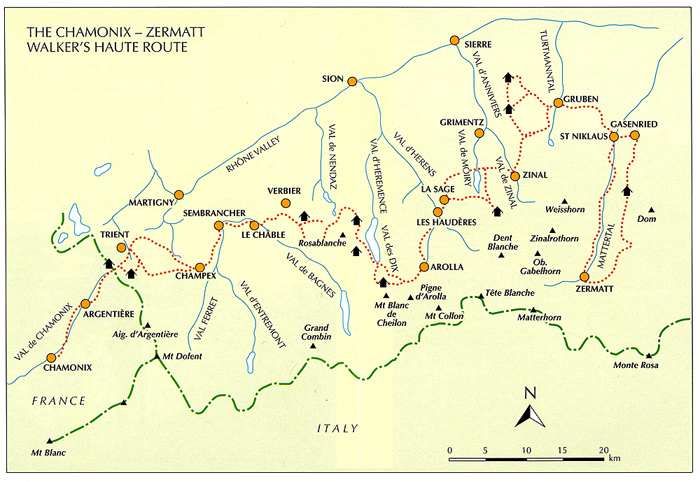 I threw a vertual dart at Google’s search results for hiking options in the Alps, and came across the Walker’s Haute Route from Chamonix, France to Zermatt, Switzerland. The hike fit our time frame, the photos were mouthwatering. 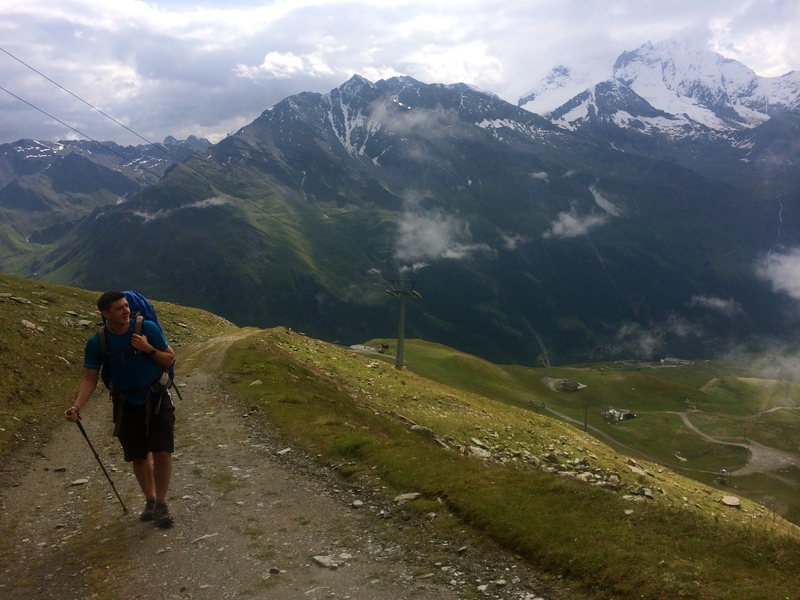 Traditionally, the hike starts at the foot of Mont Blanc and heads east to a grand Matterhorn finale in Zermatt, but somehow I latched onto the idea of taking the trail in reverse. Ben had been to Zermatt and the base of the Matterhorn previously, so we thought we’d start there and work our way east to France. There seemed to be no reason related to safety or difficulty to stick to the traditional direction, but I was surprised at the lack of trip reports from those who’ve had the same idea. The only one I could find wasn’t too helpful (Some French guy’s account of the route.) 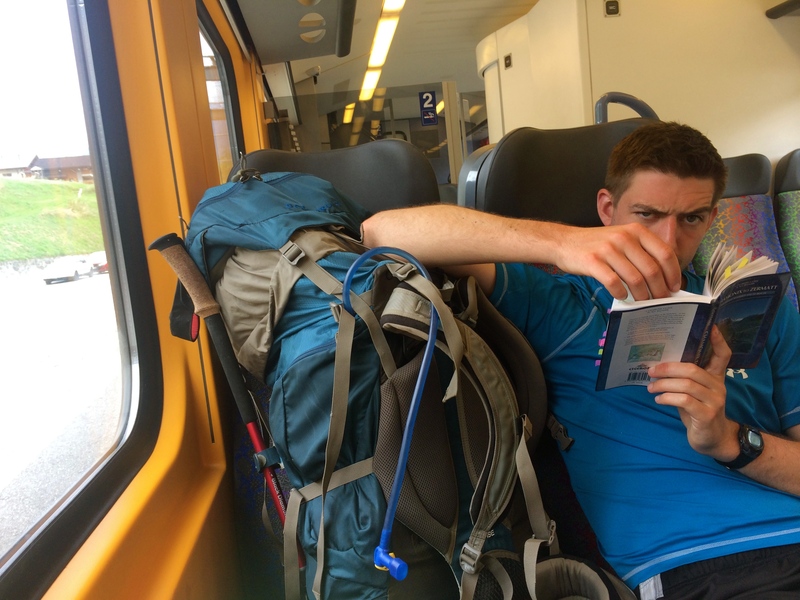 So I got my hands on a guide book, figured we could fit the milage and elevation in 10 days of hiking, bought our tickets and headed for Switzerland. Which brings us here. I love taking photos and sharing about my adventures, but this time I wanted to put together something entertaining and informative for those who may also be interested in taking on the Haute Route, in reverse. Hope you enjoy reading about the journey as much as we did walking it! I bought this guide book as soon as we decided on the route because it was the most recommended. I spent a good amount of time combing through it trying to conceptualize how we would plan for doing it in reverse and in fewer days than is planned for typically. The book is very helpful and can definitely be relied upon as a your primary guide source throughout the trip, though the maps are not topographically detailed. Ben and I are hikers accustomed to route finding in the wilderness areas of Colorado, so we had experience and good sense to rely on. We made our way without much trouble, though we occasionally improvised directions, we never really had the need for a detailed map and compass, even in foggy weather. We concluded that the toughest route finding was once you got into towns and the yellow arrowed signs became more vague and sparse. Sometimes asking for directions helped, and sometimes people didn’t even know there was a trail going through the area. I’ll make a couple notes of spots where we went off the traditional route or we ran into detours. I’d advise looking at the books publisher site for updates on trail conditions and checking at local tourist offices, especially if there has been rain or snow. I think the most helpful thing to carry is a positive attitude and some good old fashioned flexibility. Detours and wrong turns should be taken in stride and seen as just another adventure. As long as safety is always the main priority, having an open time line with few reservations to hold to, makes for a much more pleasant trek. 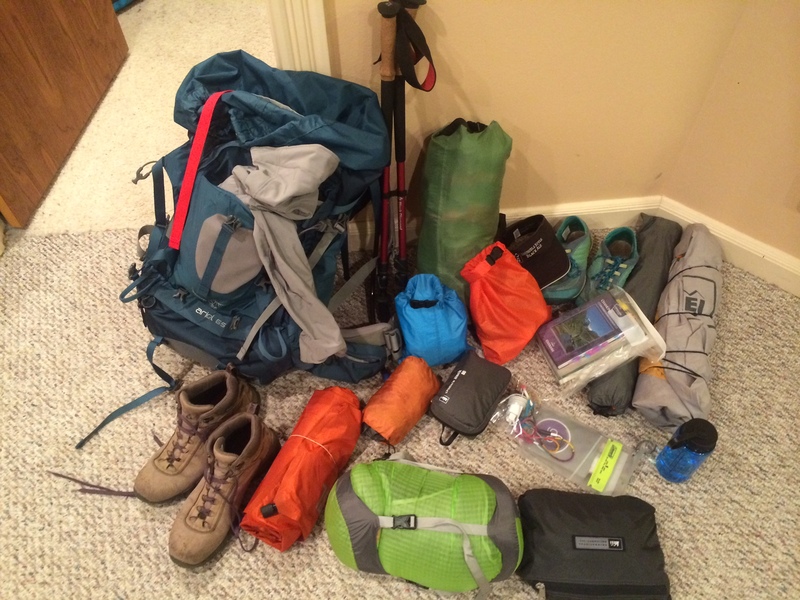 Trip reports proved very helpful as we attempted to plan our route, packing list, and daily milage. Hopefully they can contribute to your planning and pleasure reading as well! I hope my account of this hike will be similarly useful to others just as these were to me. There are charts and maps with expenditures and elevation profiles included in these reports that I found especially useful for reference and planning. Raincoat – I opted out of the actual raincoat because I thought my soft shell would be sufficient. 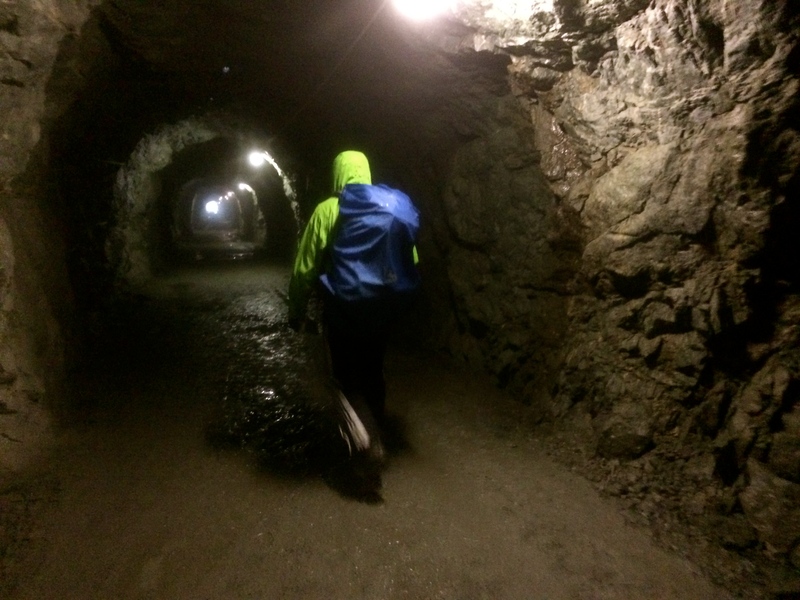 I am exceedingly grateful for the disheartening rain and detours of our first day, which gave me the opportunity and the rationale for dropping some dough in Zermatt for a rain jacket that wouldn’t soak through after just an hour of rain. The jacket was also used as a sleeping bag cover when our tent leaked. It was mildly effective. Shelter – We spent 6 of the 10 nights in a minimalist shelter. Composed of my REI Half Dome 2 rainfly, poles, stakes and footprint. I waterproofed the fly before the trip, but the tent had several years of Colorado sun behind it which drastically reduced it’s ability to make it through a rainy night without dripping all over us. Other than the drips, the shelter worked well for the two of us and we split the 4lb weight. Other complaints include the zero protection from bugs and slugs. But it was cheeper than hotels! Down Sleeping bag – Though it is light, warm and packs small, the two rainy nights left me soaked and the down took a long time to dry compared to Ben’s synthetic bag. I was impressed with some of the warmth it lent even wet. Ultralite Inflatable Pad – LOVED it for the comfort and packability! But mine was brand new and Ben’s seasoned pad had a leak that tortured him with night after night on the cold ground even after spending a hotel evening patching and glueing the leaks we did identify. Spork – I for some silly reason forgot or decided against bringing my camping spork. I promptly bought one along with my raincoat. Water Filter – We probably would have been just fine without one. 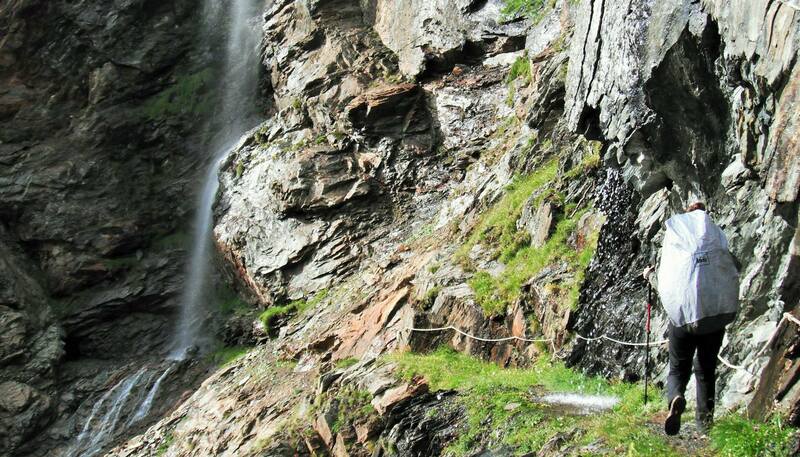 Many areas throughout the Alps have potable water fountains in public, but as we got closer to France we found less. Also, areas near mines or farming pastures had water that I wouldn’t want to be stuck drinking straight. I have been very impressed with my lightweight squeeze pouch filter by Sawyer. Casual footwear – You want something to wear while not hiking. Ben wore flipflops; I love my Merrill Trail Gloves for a quick drying, lightweight, versatile option. iPhone and waterproof case – My phone is my camera so I made sure it was protected from rain and the dangers of hiking. I also bought an international data plan from Verizon for 25$ per 100MB. It was a lifesaver for looking up maps, transportation, food sources. I think people’s eyes glaze over when they think about European vacations because of the inherent price tag. I’m not really going to refute that it’s not really cheep, but I do think it’s worth the cash and it’s also possible on a lot of different budgets. I had a little bit of the same attitude about money as I did about following the maps and trail. Carry a positive attitude and don’t plan things down to the T. Have money available so that if you need to take a train or get lodging for the night, or run out of food, you don’t break down in tears because you had to spend more than you planned. Money is just money and you’re on the trail to experience something beyond finances. The biggest expense is of course travel. I got a great United Airlines ticket from Colorado Springs to Washington (which I don’t think exists anymore…) then to Zurich. We complicated things up a bit by flying into Zurich and out of Geneva. Honestly it would have made more sense to do roundtrip through Geneva, but I just wanted to see more of the country. Then we had train tickets from Zurich to Zermatt and a shuttle from Chamonix to the Geneva airport. All these we bought as far in advance as we could with planning. 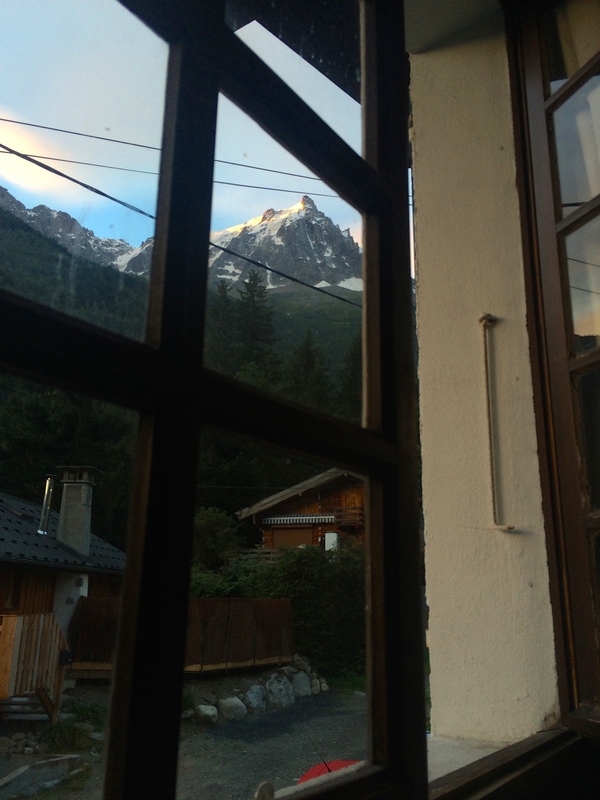 We also bought our last night hostel room in Chamonix. Beyond those expenses we tried to stay cheep by packing food from local grocers, which were tough at times to find, especially in more remote locations. And we had our own shelter so we could avoid staying in too many high priced lodgings. I was hoping for about 50/50 for lodging and camping, but we ending up staying six out of the ten nights in the tent even with rain. We also spent some money on alternative transport throughout the route. 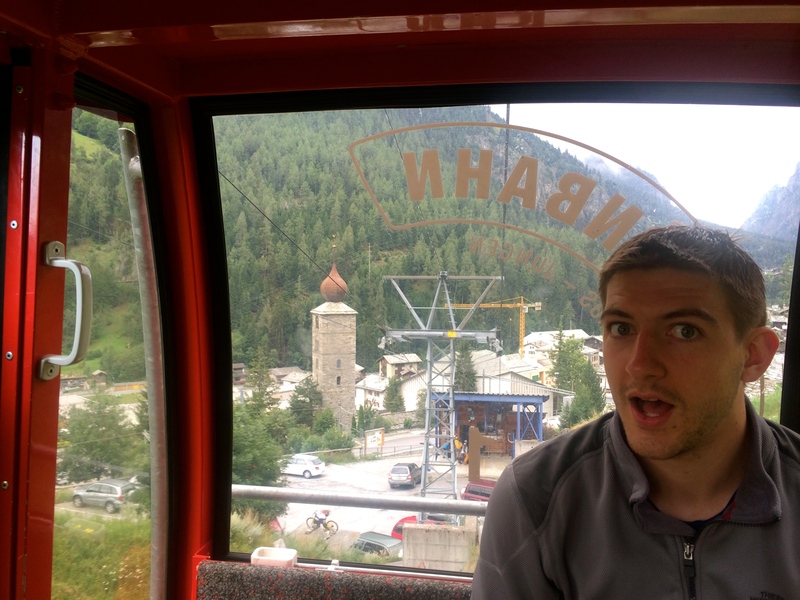 We ended up riding all but one of the available gondolas, and had a couple bus and train rides to cut down on rain and milage. Departing Colorado Springs at 6am started the journey to Zurich, Switzerland. Over 24 hours of sleepy yet sleepless travel brought me to Zurich at 8:30am with the morning to explore the city while waiting for Ben and our train to Zermatt. I was thrilled to be back in Europe and enjoyed having some down time to saunter through the thin streets, munch on raspberry gelato, and ponder Mennonite history while gazing at the Grossmunster Cathedral. We loaded up on groceries and boarded our train from the main station about 3pm. I enjoyed the foggy mountain scenery for the 3 hour ride (two connections) that brought us to our trailhead in Zermatt. 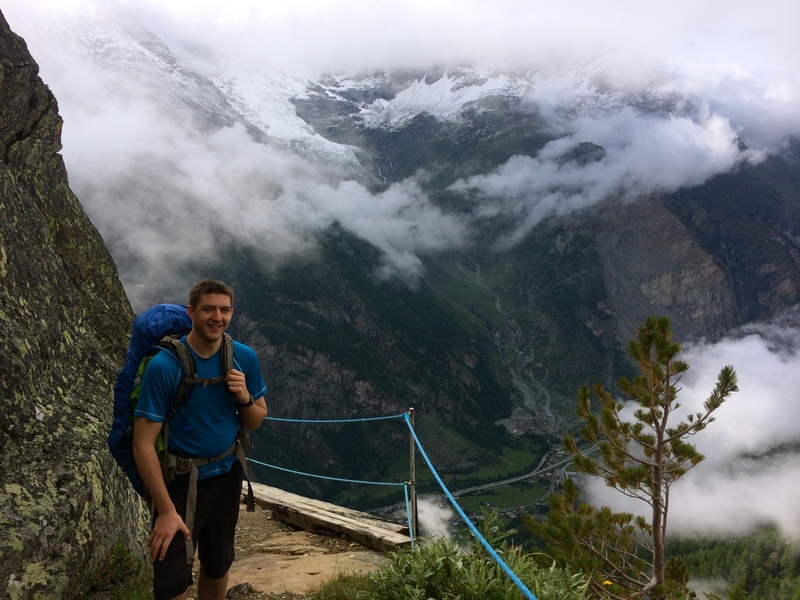 Even full of clouds, the Zermatt valley gave me a great first taste of the tight alpine valleys and towering rocky faces that we would come to know well. We arrived in a steady drizzle and stopped by the tourist information office to see that a steady drizzle would probably accompany us for the next few days. After exploring the streets we set up our minimalist tent in the campground just north of the train station. It was already full of tents and various groups planning hikes up the Matterhorn and wishing for clear skies. We settled in to an already soggy tent, for dinner and what would be the wettest night I’ve ever had in a sleeping bag. Thankfully, my 10 degree down mummy bag kept me mostly warm despite soaking through, and our thick inflated and insulated sleeping pads kept us off the soggy ground. Or at least mine did. Ben’s struggle to maintain sleeping pad inflation may have already began at that point. We awoke early, to a welcome quiet that said the rain had ceased for now, giving us enough motivation to pack up and get walking while the skies parted enough for our first glimpse of the Matterhorn. We partook in breakfast at one of the many swiss springs found in towns throughout the trip. The first one by a church that randomly serenaded us with 15 minutes of church bells. The yellow trail signs pointed the way for Sunnegga via Findeln but they were a bit unclear as we made our way out of town. Heading south we followed neighborhood roads and little hiker signs until we made it to a clear trail up the valley wall. We would have had a stunning view of the Matterhorn on this trail but clouds shrouded us as we hiked high into some leftover snow from the night before. 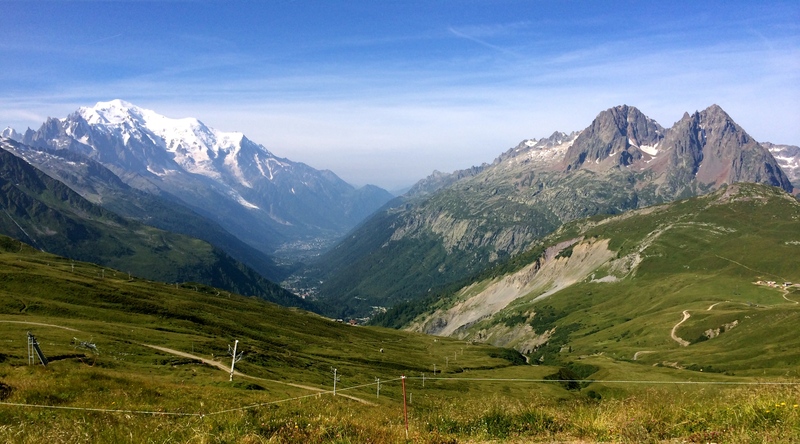 We gained about 600m of elevation in the first couple hours to the large cable car station of Sunnegga; we continued on the Europaweg trail that would hopefully take us to the Europahutte which was an estimated 5hr hike up the valley. 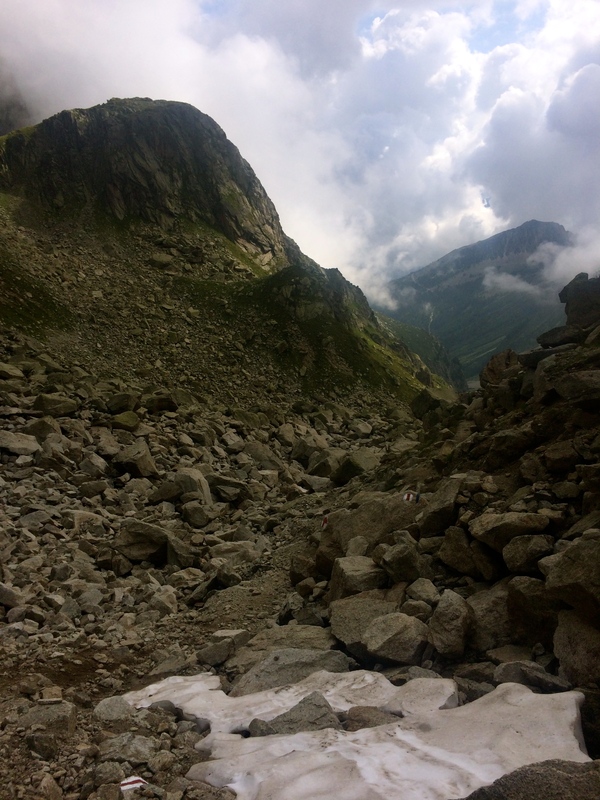 We thought we had gained our elevation for the day, but a very wet July in the Alps resulted in countless rockfalls that closed the trail after Tufteren. Much to our dismay we headed down from that little hamlet back to Zermatt. Essentially making for a lovely morning hike that got us no where. I was however thankful to have the opportunity to buy a rain jacket in one of the many overpriced Zermatt outdoor stores, to replace my soft shell jacket that was just not quite waterproof enough to cut it in the very wet weather. Purchases made, we hopped on a short train up the valley to Tasch where we could hike back up to the Europaweg and get back on track. After asking for directions in a local shop, we followed the signs for Taschalp, and zigzagged our way up 800m of beautiful dense woods into and back out of the valley to the village at the foot of some impressive snow glazed peaks. 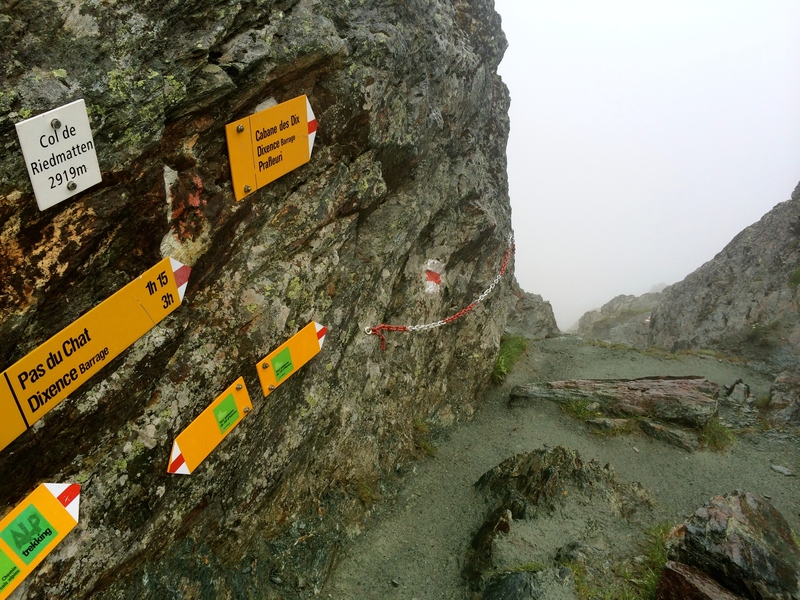 We snacked and hiked on, following the signs for the Europahutte (still 5hrs away…). We quickly began doubting the reliability of these frequent yellow signs and their claims to how long it would take us to reach our destination. Unfortunately, they proved themselves remarkably accurate, though I would have really appreciated more details about the route ahead, especially when it came to detours. After leave the Taschalp valley, we crossed what came to be the sketchiest section of the whole trip. The valley wall was constantly crumbling, especially in the wet weather, so we walked under and through manmade protection on the trail. Cement ledges and even piped tunnels guided us through maybe a quarter mile of foggy rocky terrain. Even beyond the structured protection we would stop and listen to the sounds of rocks tumbling down the hill sides around us in the mist. We made haste past sections of trail that had clearly been recently damaged by smashed boulders, and found solace in hiking once more into thick trees. Though we were making what felt like great progress, signs still stated “Europahutte 4hrs” and soon we came across a detour sign with a vague map instructing us to head down the valley toward the town of Randa before making it back up to our goal for the night. Not sure where exactly the detour was and really not wanting to loose all our elevation again, we hiked on toward the hut and came around a beautifully exposed corner into another valley. 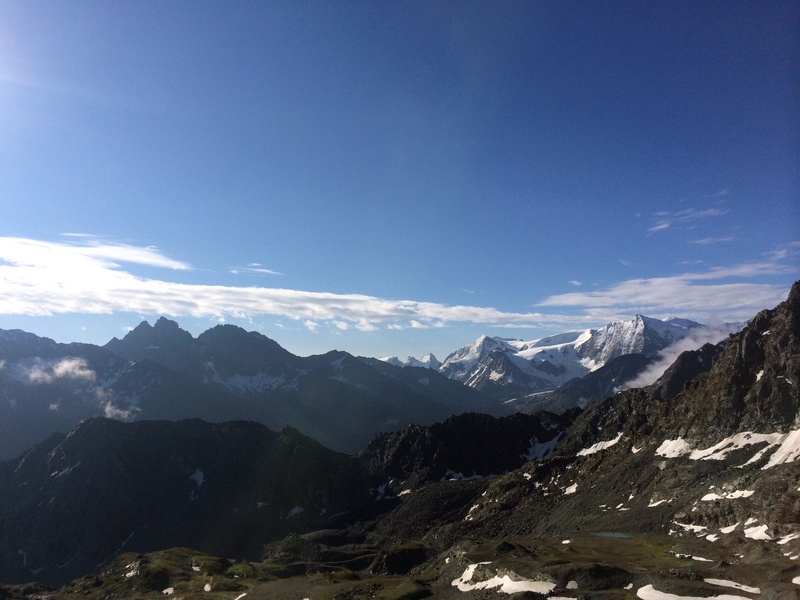 The clouds were clearing and we had a stunning view of the Weisshorn and even a glimpse of the Europahutte farther north. Our hopes rose, and we traversed with hopes that only an hour or two more of hiking would bring us to our lodging for the night. The sun even came out to encourage us across some swollen streams that crossed the trail, only one of which had a bridge. Our determination pushed us through taking a couple risks to get over and under several waterfalls, until we came out the other side of the valley around dinner time hoping for a warm welcome to the hut we’d seen previously. Nothing but another detour sign greeted us. We hiked on hoping our persistence would be rewarded, only to find a massive suspension bridge that led to the last half mile up to the Europahutte. The bridge’s middle hung in shambles rendering it impassable. With the hut in sight, we could do nothing but head back down to the valley floor once more. The 13 hr day coming to a close, our feet aching and our determination drained, we trudged into the tiny tourist town of Randa and walked the road a mile and a half to the campground. Setting up camp as the light faded, we ate, stretched and groaned into our wet sleeping bags hoping our first day wasn’t setting the tone for the whole trip. At least it wasn’t still raining. 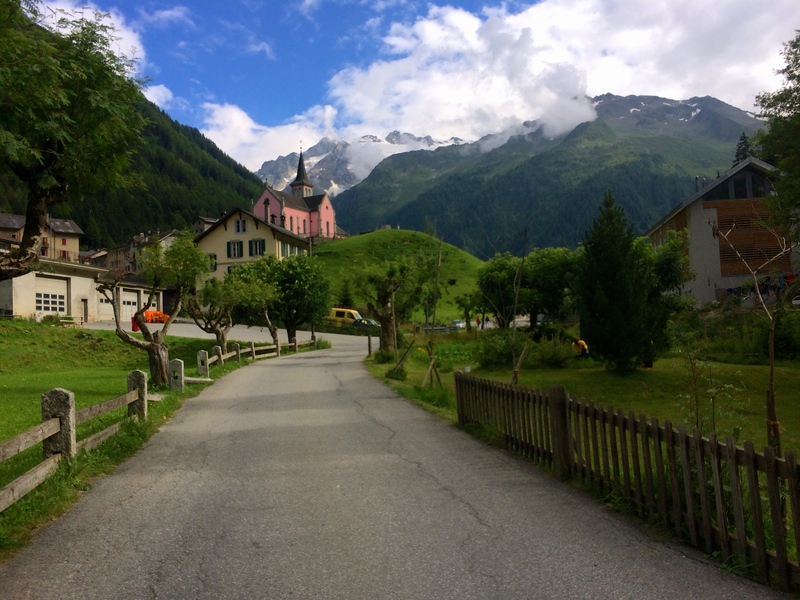 With dreams of the Europahutte behind us, we started off from the Randa campground, north following signs that would take us to St. Niklaus via the valley trails and roads. I misread the guide book and was planning for a short 3 or so mile stroll. Our sore legs dutifully carried us on the flat yet somehow still brutal 7 miles into the town at the mouth of the valley. The walk meandered on side roads along the river and up through farms and pastures with the valley walls clouded above. We arrived in a sleepy downtown St. Niklaus around early afternoon and found a small grocery to restock once it reopened at 2pm. Next stop was Jungu (or Jungen) 800m up the valley wall, and we had no trouble deciding to take the 11CHF cable car that took us straight into the mist. We had called ahead to the only lodging listed in the guide book, and secured two beds. I was thankful that Ben could decipher the thick German dialect of the innkeeper. The soggy Alpine hamlet of Jungu was stuck in the clouds for the rest of the night, so we enjoyed a restful afternoon and evening in the tiny restaurant that would become our bedroom. Some beer, a wood stove to dry our gear, and the company of two English hikers from the London Mountaineering Club kept us entertained until sleep overtook us. There were also some mischievous local boys who woke us with knocks on doors and windows late in the night. We woke early to enjoy a hot breakfast of sausage, cheese, yogurt, cereal, breads and jams made by our friendly innkeeper. We shared stories with our new English friends and then all started off into the mist with at least a glimpse of the valley below. Feeling well rested, we set a good pace up the smooth switch backs that made their way toward the ridge. There wasn’t much to see in the fog, but stone walls by the path pointed out native flowers and we came across a bench perched above what would have surely been a stunning view. 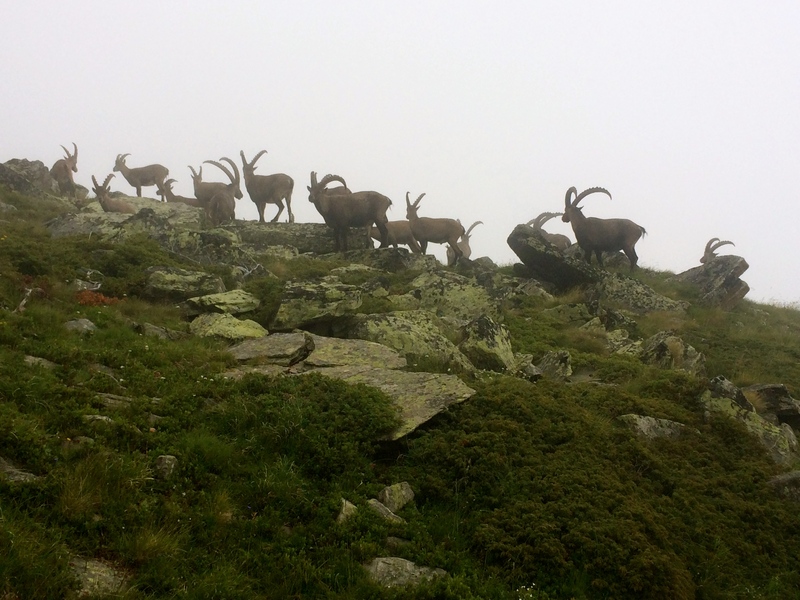 Around a bend we found ourselves in the midst of a herd of ibex for our first encounter with Alpine wildlife. The impressive horns stood out in the grey air, and they seemed as unconcerned with us as the ambivalent Rocky Mountain Goats of Colorado. Hiking on into the high valley below our first pass, we hiked over talus and alpine cobble stone like trail, well marked with painted blazes. Late morning we broke out of the clouds to a beautiful blue sky and a straight shot up the valley to Augstbordpass. We carved our way up the gravel trail as other hikers made their way down, most sporting similar packs, trekking poles, and smiles. The saddle sat at 2894m (9,495ft) with a glistening view south to the Dom above the Ried Glacier, all cloaked in an ocean of clouds. If one was so inclined the two peaks on either side of the saddle would be nice summits to bag if time, energy, and snow conditions allowed. If one was planning to stay in Gruben that night, I’d say go for the panoramic views. They look well worth the very rocky trek to the top. We ate lunch on the pass, and then tromped down 1000m to Gruben, a beautiful decent through rock, tundra, and high alpine cow pastures before zigzagging onto the valley floor. Gruben lay in the pristine grassy valley filled with touristy cabins and a hotel for beer and food. We snacked on soup, filled our water and hiked on since we couldn’t stock up on groceries or get cheep lodging in the village. We followed the yellow signs through cow pastures, getting a little confused, but we ended up finding the trail through some condos that led up the opposite valley wall. 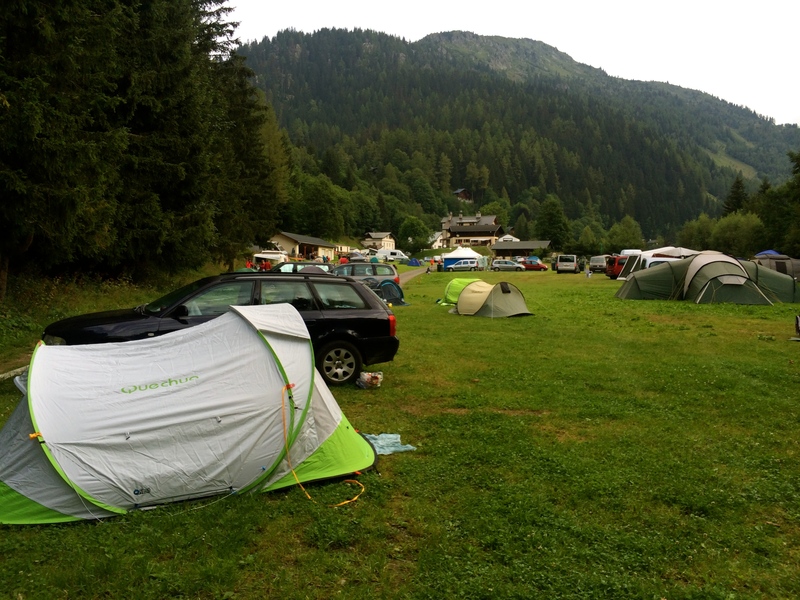 Our goal was to find a clandestine camping spot near Chalte Berg. The switch backs made quick work of the 500m valley wall, and after wandering through a field of bell-laden cows, we opted to spend the night down an overgrown road at about treeline. We spent the evening reading and taking in the view before setting up our tent at dusk, hoping no one would wander by and question our off the grid camp spot. It was a stunning evening. 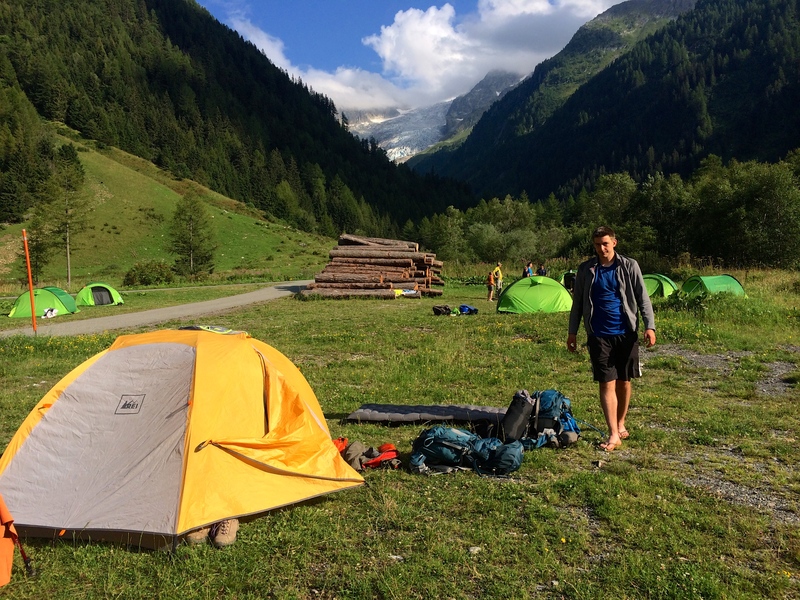 Campsite panorama with the Weisshorn at the valley head. A sunrise start in the clouds carried us up the road into Chalte Berg, where we wandered through a dung-coated cow farm perched in the valley. Hiking past farmers starting their day to such high alpine beauty, puts into perspective our odd walking adventure. 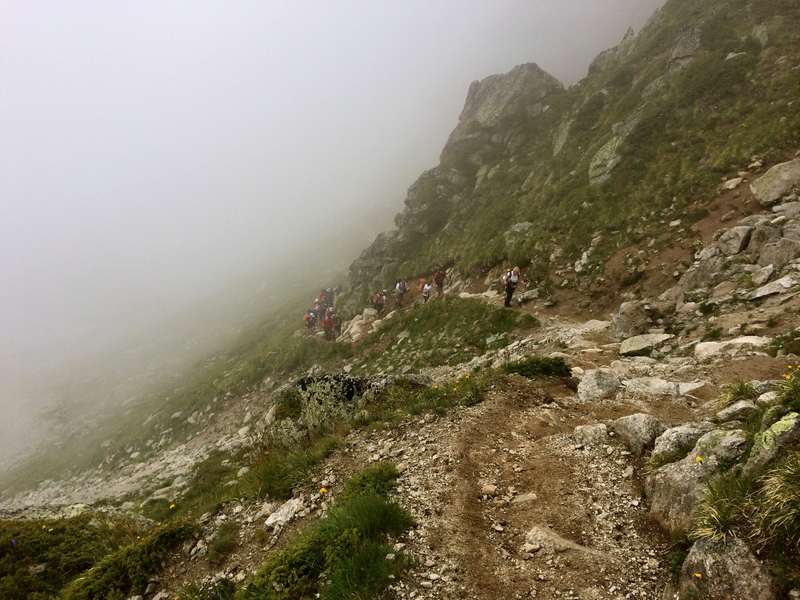 We stepped on through the wet tundra and into the mist below Forcletta, our high pass for the day. 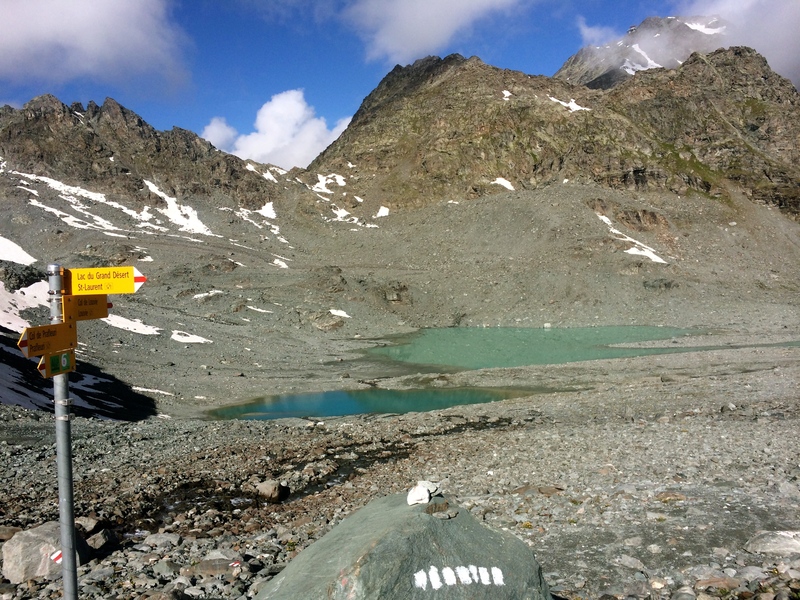 We opted for this pass instead of the northern Meidpass because we were heading straight to Zinal instead of taking extra time to stay at the Hotel Weisshorn or the Cabane Bella Tola. If money and time allowed, these would be worthwhile destinations. 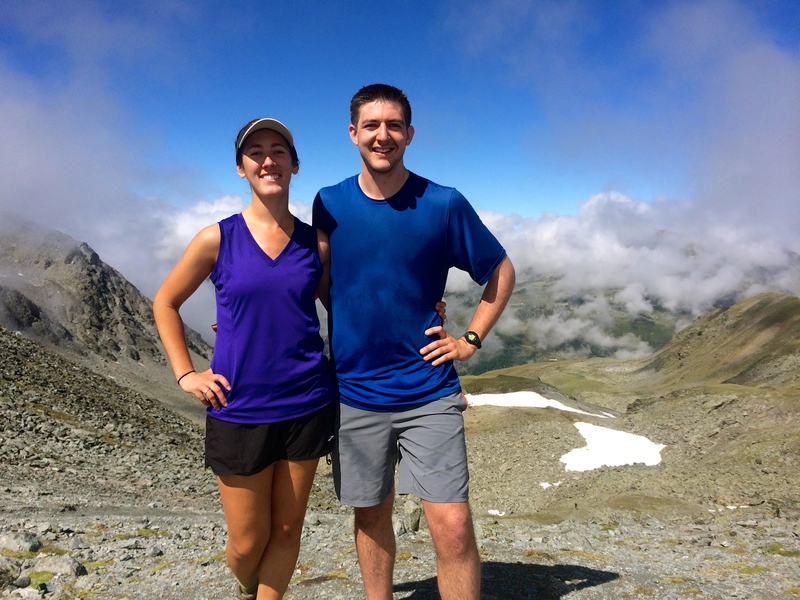 About an hour out of Chalte Berg we summited the pass and enjoyed the sun, clouds, and view all to ourselves. A good start to the day. 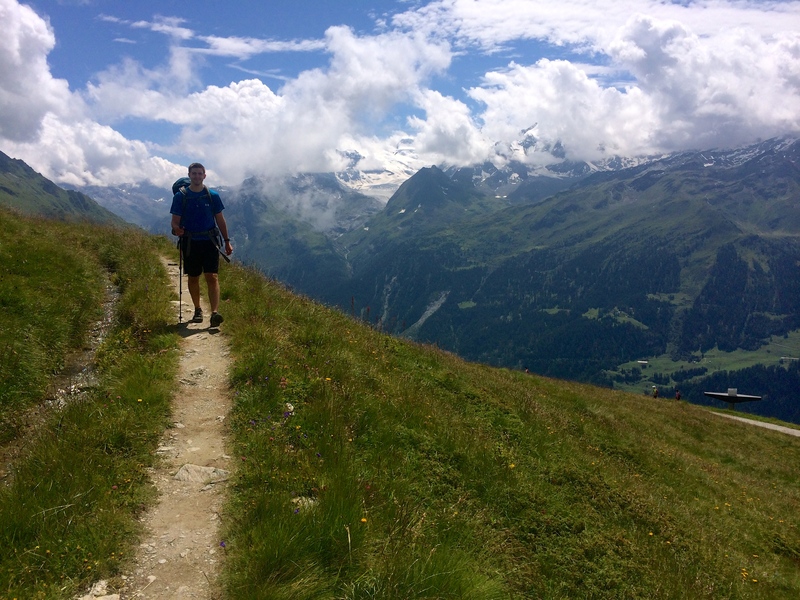 Mid morning we started our decent into the Zinal valley, following signs for the long traverse north. This was our first gorgeous day of sunny hiking, and our spirits soared as we trekked through green tundra and pasture while reciting and then singing show tunes mostly in outrageous British accents. Our goofiness settled as we met many hikers along the high valley trail on day hikes and trail runs. 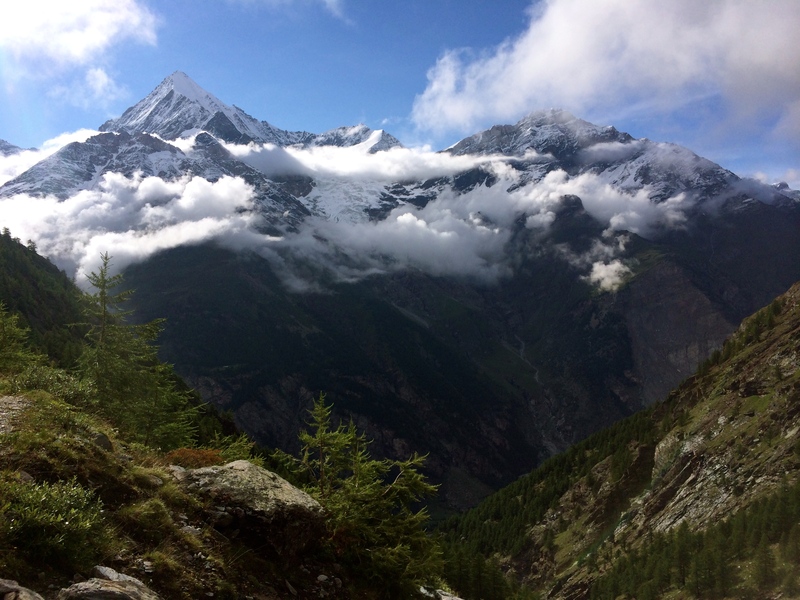 Eventually, the trail descended into the small town of Zinal via a mountain bike track that zigzags very steeply down for a knee pounding couple hundred feet. I found it oddly easier to step backwards down the trail; Ben did not agree. 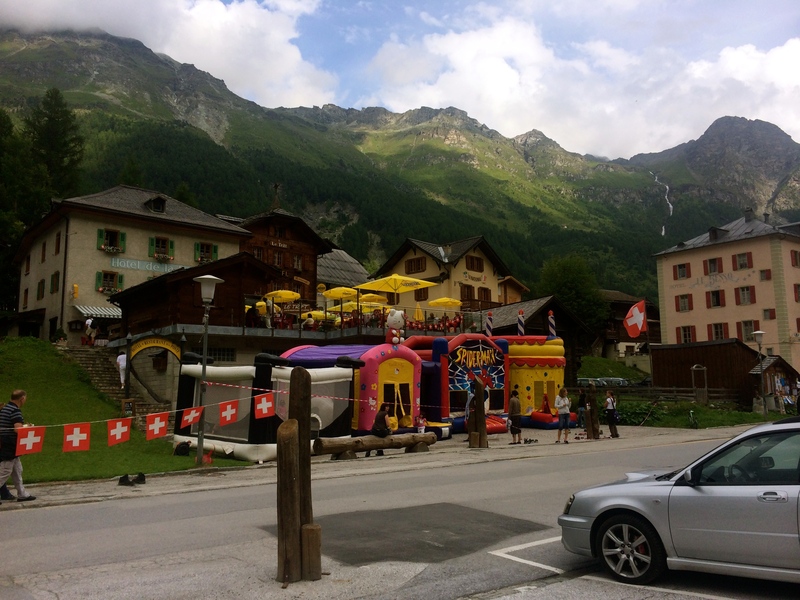 Eventually, we popped out of the trees into town and followed the paved roads to main street where Swiss tourism embraced us. We checked out the local grocer after splitting a wonderful daily special at the Hotel le Besso. We were thrilled to find that the cafe had a great selection of craft beers, compared to the bland pilsners we found everywhere else. After savoring the meal, we spoke with a traveling British couple at the cafe who advised checking into a wonderful room at the Hotel du Trift for the night. We were pleased to pay a reasonable 55CHF per person for a 2 bed private room with a community shower and balcony access. Showers and relaxing in our comfy quarters took up the evening. After dark it became apparent that August 1st was something special. 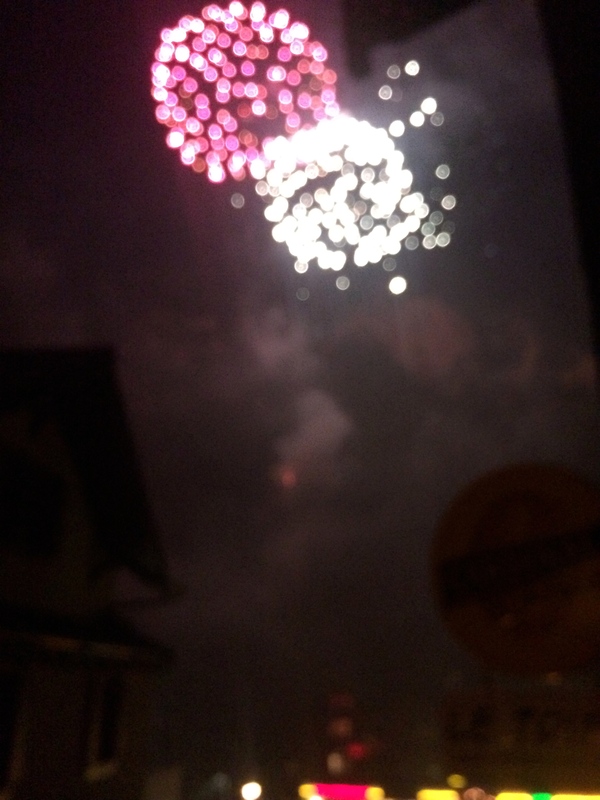 Swiss National Day! An impressive fireworks display was launched from the valley wall, making our balcony an ideal vantage point for the 40 min show complete with music on main street. The celebration continued with dancing in the streets till sometime around midnight. I lay in bed struggling with my urge to dance and desire to sleep. Waking to rain drove us deeper under the cozy covers until better weather and more motivation developed. Thankfully the clouds let up enough mid morning for us to get groceries and catch the large cable car up the valley to Sorebois. The mountain side is a vast ski slope in winter and summer brings popular European hobbies like mountain scootering and paragliding. Even in the gloomy weather there were various activities represented in the glass box that took us into the clouds, for a reasonable 14CHF a piece. 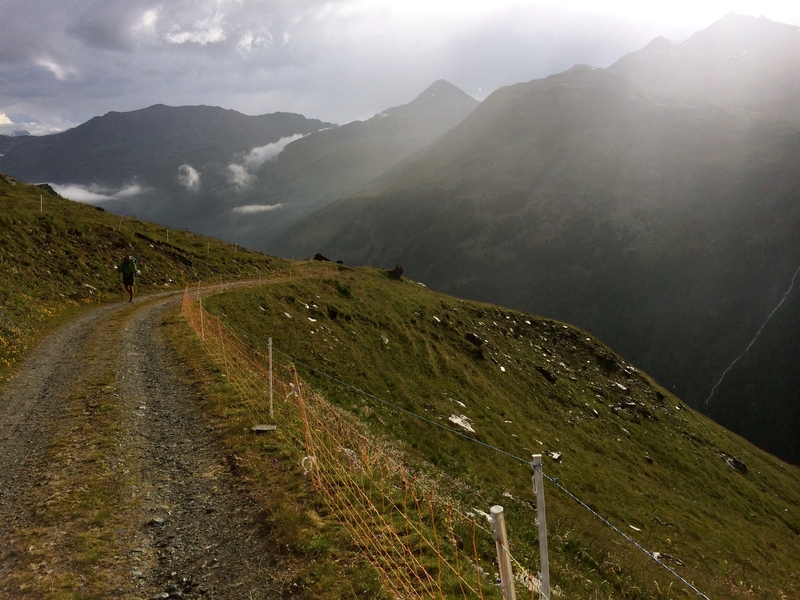 It was an easy jaunt on gravel road winding through the slopes up to the Col de Sorebois. We then dove into clouds and descended the lush grazing fields, dodging cattle and cow pies to the Barrage de Moiry before noon. 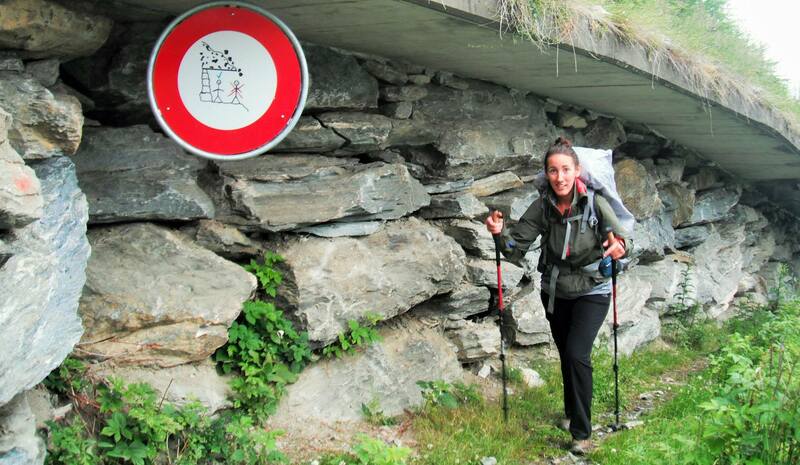 Making it to the Moiry Damn and bus stop just as the clouds opened up. There were a couple options from here. 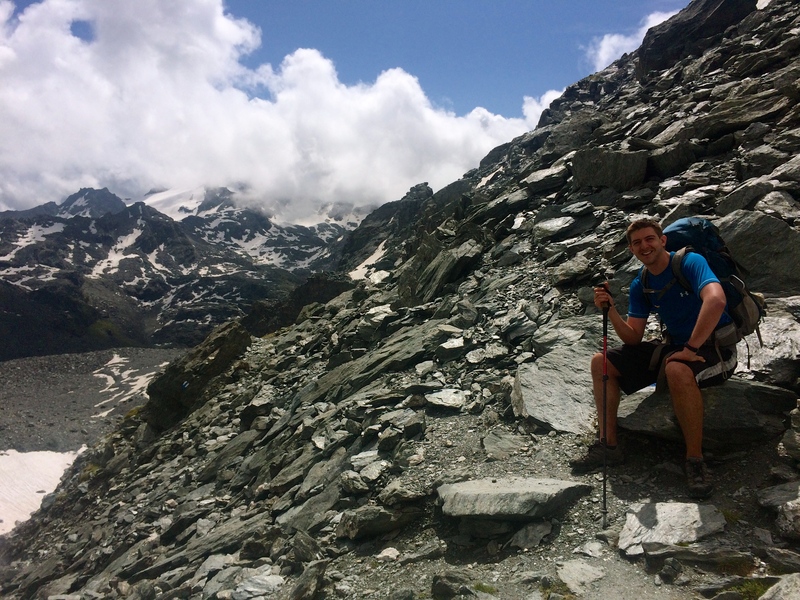 A trail option would have been to hike South along the Moiry up onto the glacier to stay at the high Cabane de Moiry, but that adds another day and paying for a night indoors. Our plan was to head straight across the dam and up to the Col de Torrent on the opposite side of the valley and then down into La Sage. However, the rain was cold and my motivation for hiking another 10k and 1000m down was pretty nonexistent. So, after some deliberation we opted for bus hopping to Grimentz. We felt very lucky as we jumped from bus to bus in Vissoie and then onto a train in Sierre, all with smoothly timed transfers. 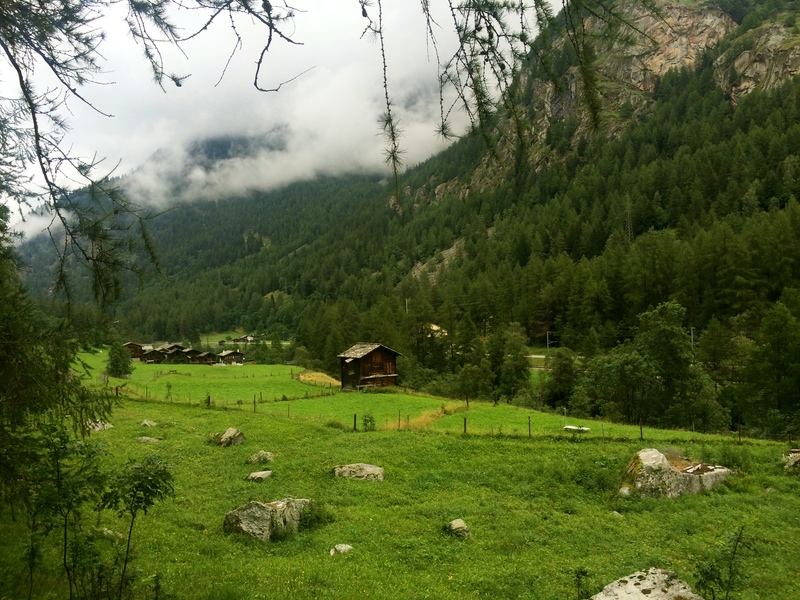 Then, back up the next valley by bus from Sion to Les Hauderes and finally on to Arolla. The public transport is very impressively run, and we had few problems getting around our rainy mountain. Though it did end up taking about as much time as it would have for us to hike it, and the weather looked like only about half the hike might have been in rain. 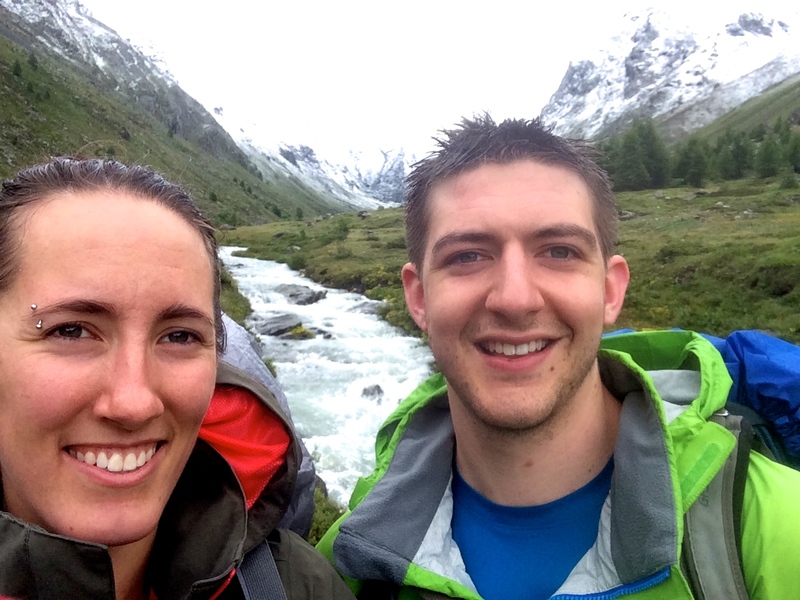 The whole trip cost us each maybe 40CHF or so, but we got a good rest, saw more of Switzerland and even randomly bumped into and traveled with our London Mountaineering Club friend, Grant, into Arolla. 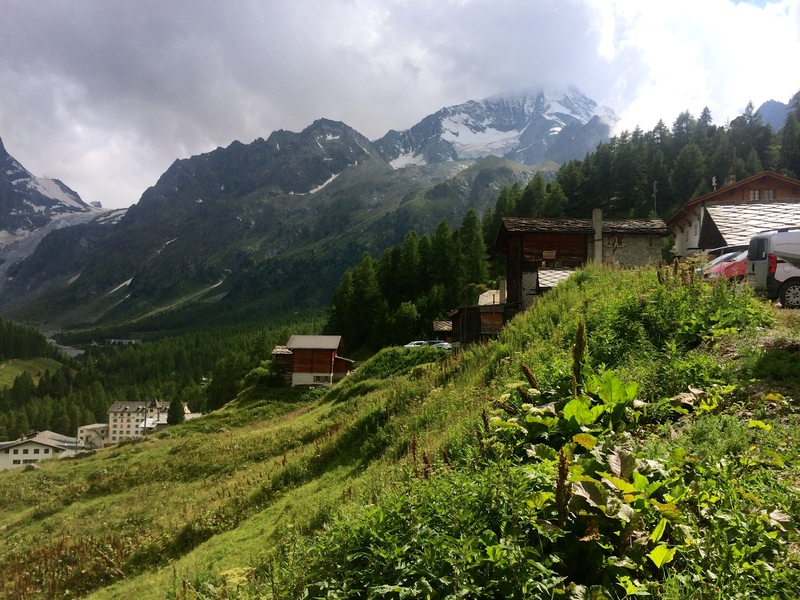 Once in Arolla, we stocked up on two days worth of food in the tiny convenience store, and set up camp in the beautifully grassy and reasonably priced Petit-Praz, a camp ground down the hill from Arolla. We enjoyed some sun, wine, and chocolate just before it lightly started raining again. 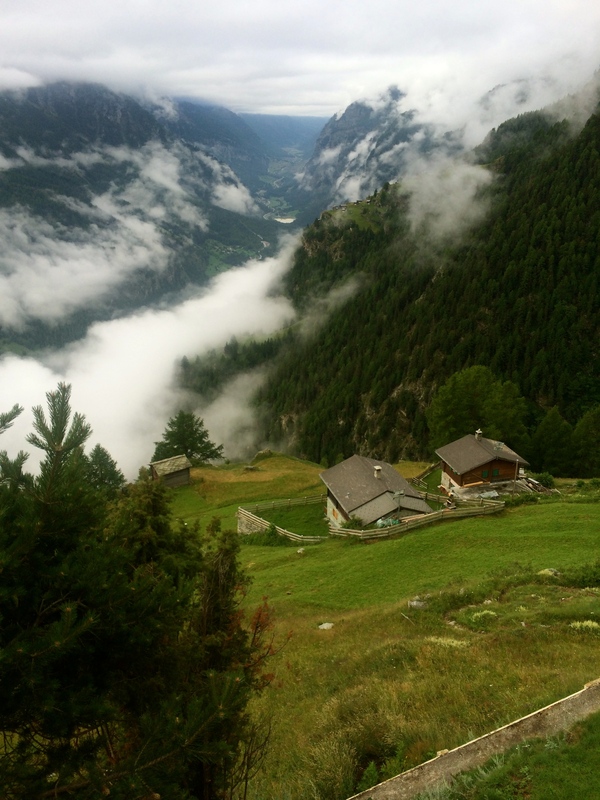 Hiking up the hill to Arolla, with clouds hanging low, we started our trek to higher elevations and more remote trails. 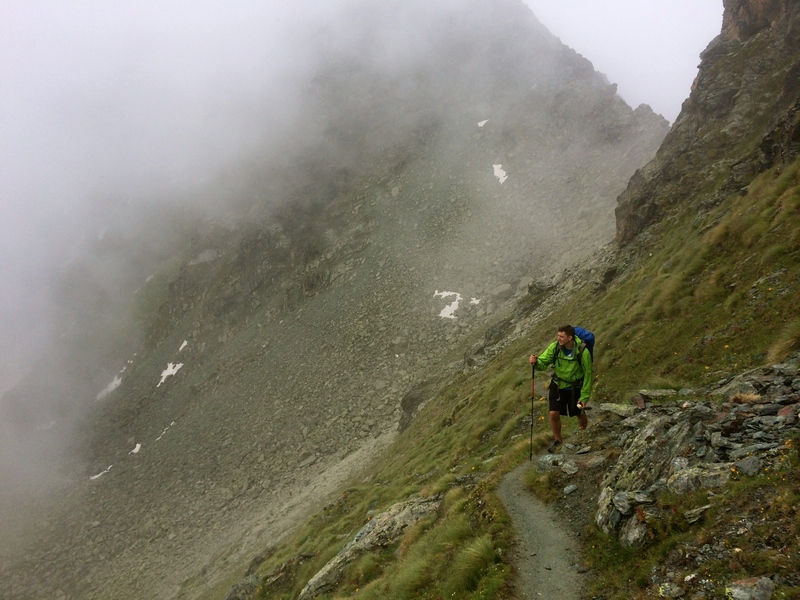 Winding our way out of the Arolla valley, was a pleasant plod as Ben’s mystifying story telling meshed with the misty atmosphere and fueled our increasing speed past debris of old cable lifts in the high valleys. 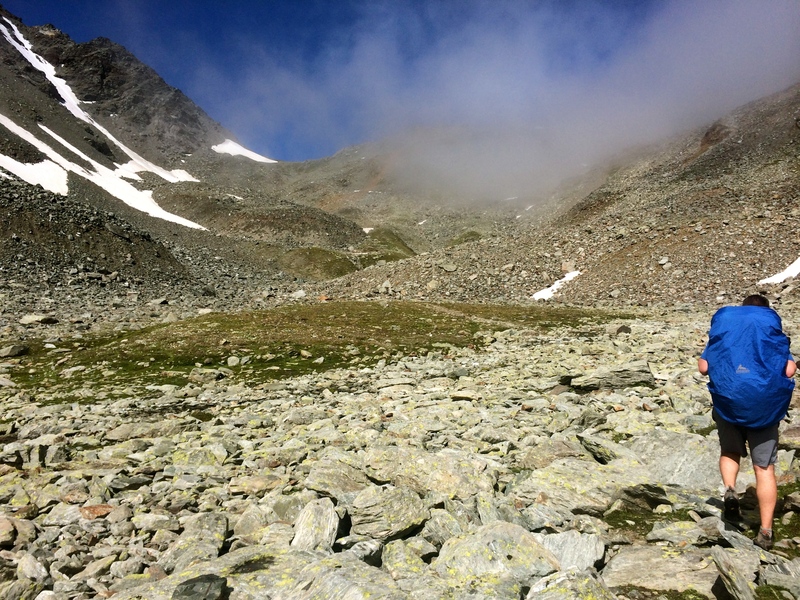 We leapfrogged with another pair of hikers as we neared the pass, choosing the northern Col de Riedmatten. Standing at a high 2919m (9,577ft), I correctly thought it was the shorter route since we were heading down to the Lac itself instead of continuing on to the Cabane des Dix; however, Riedmatten is a wonderfully steep and precarious climb to the pass with very loose slippery terrain on the western side, and we had no reward of a view on top of the wet rock. 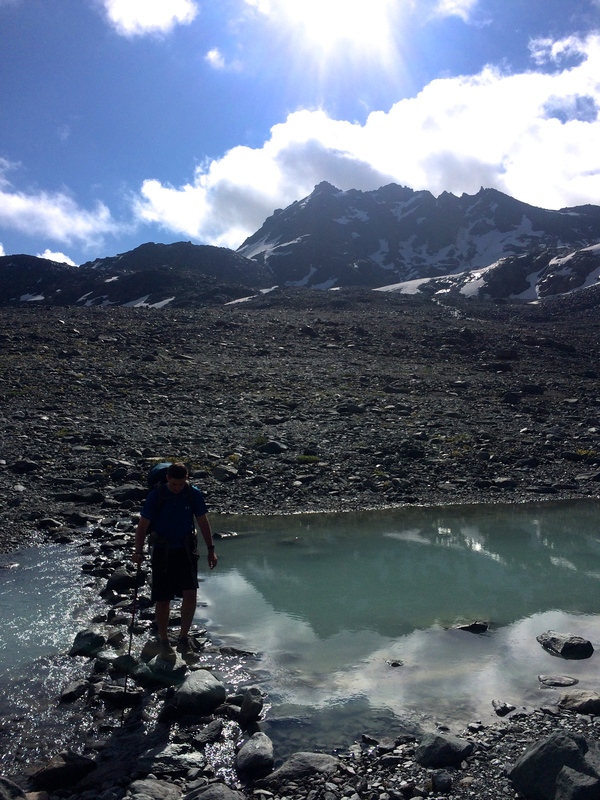 Thankfully, Ben and I are sure on our feet and are well accustomed to sketchy footing, so we safely made our way down to the talus filled basin below the Glacier de Cheilon. We enjoyed lunch on the rocks with a thick foggy view. I would advise taking the adjacent pass, Pas de Chevres, if you’re at all worried about footing or weather. 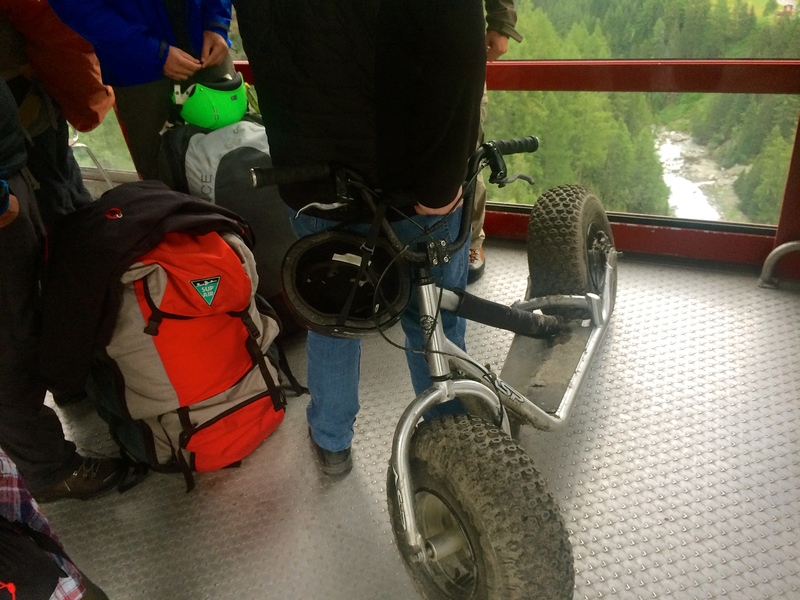 Though Chevres takes you across some sketchy looking bridges and ladders in order to get down to the glacier. So pick your poison. 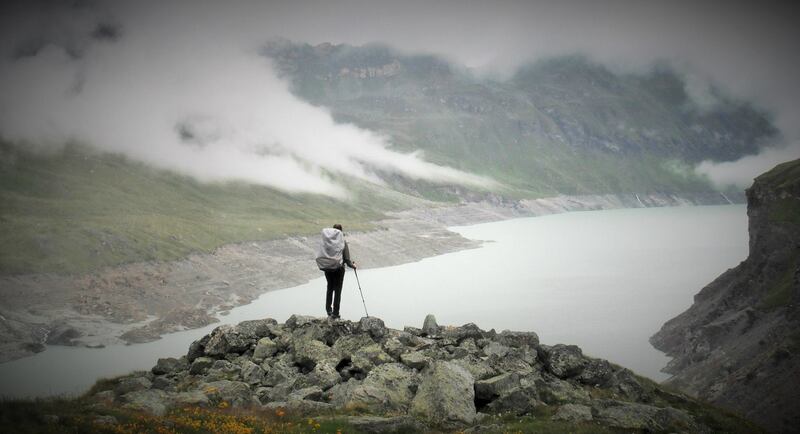 We kept moving toward the Lac des Dix, with the cold rain driving us quickly along the rocky though relatively level trail. 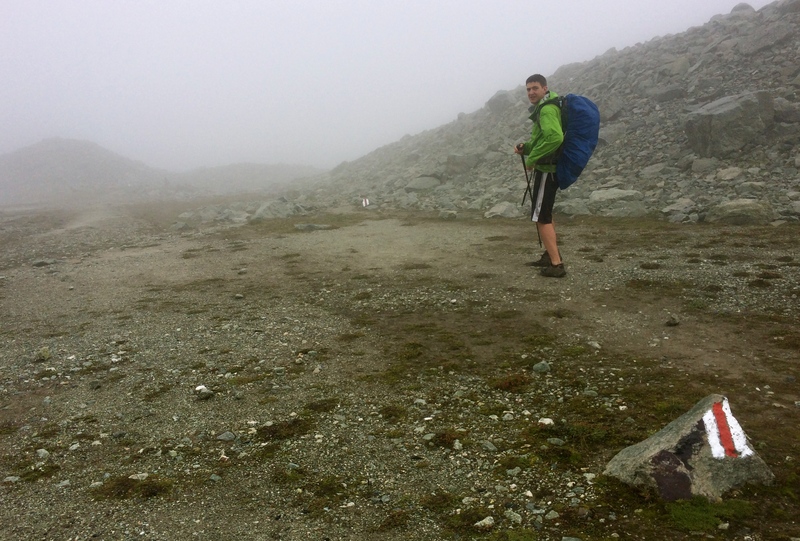 For two hours, painted blazes and cairns were thankfully plentiful in the mist, and hefty bridges carried us across several engorged rivers cutting beautifully through red and white rock before we crested the ridge at the head of the Lac. Our first view of the day made for great photo-opts before we cut down the dense moist green tundra to the broad track that loops around the western parameter of the water. 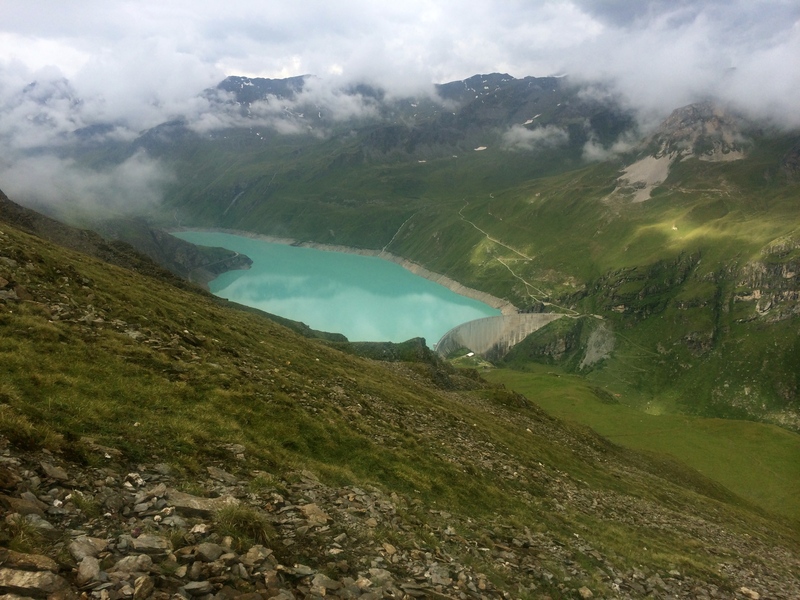 It is easy walking from here with a stunning view of the impressive reservoir even in clouds. For about 5km, the hiking is flat and level and prime for a stiff pace. 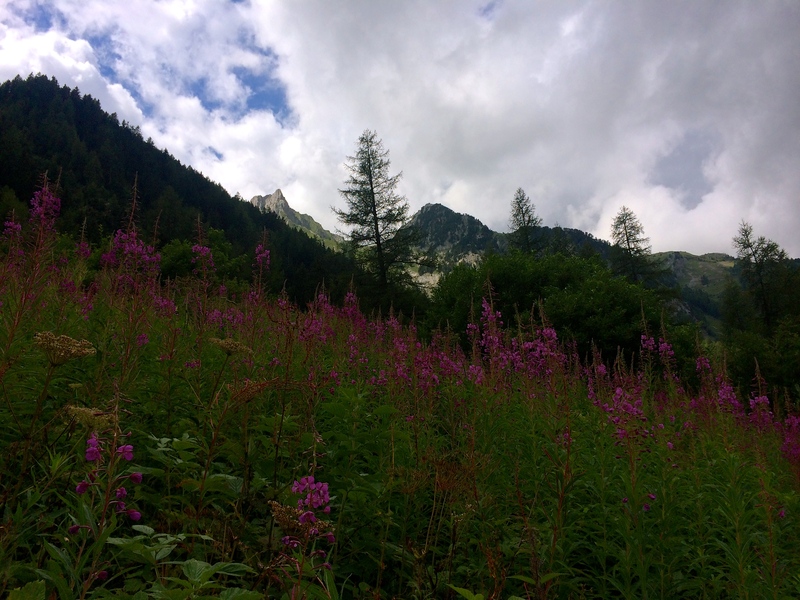 Assuming we’d see obvious signs for the Refuge la Barma and the Col des Roux, we hike on autopilot letting our legs and conversation move freely. Not sure if it was the conversation or the cold rain, but we found ourselves trekking much longer on the flat track than expected, missing our expected turnoff. If you hit the tunnels you’ve gone too far, unless you want to see the dam. The track tunneled in and out of the valley wall, and after two hours brought us upon the dam on the far north end of the Lac. The Barrage de la Grande Dixence is the world’s highest dam at 284m (932ft) which holds back some 400 million cubic meters of water and is a part of the large scheme of dams, tunnels and feeder pipes throughout Switzerland. It was cool to see the dam, though the magnitude of it was lost in the fog, and we were a little unsure if we were on the right path or not. 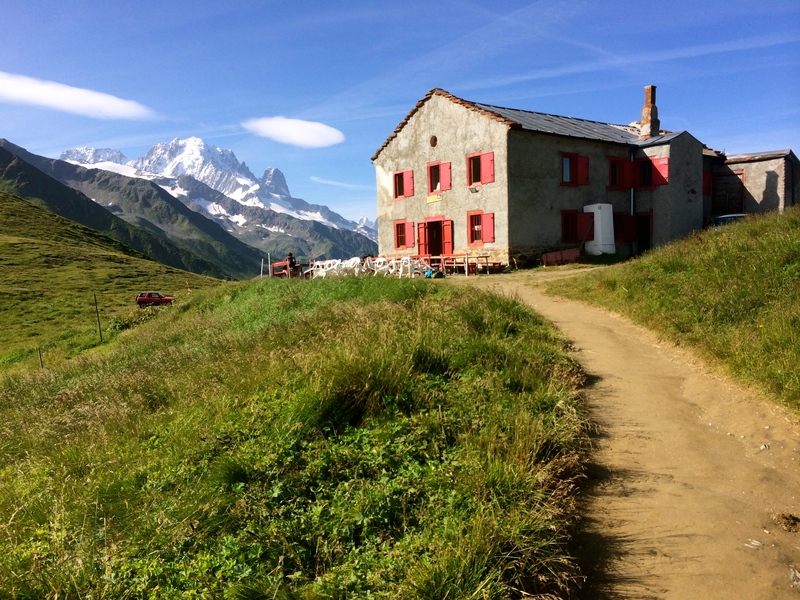 But signs pointed to the Cabane de Prafleuri, which was our only real option for the night’s accommodations. Following another road switchbacking up the valley we came around the ridge to a basin perched in the clouds. We followed the single track trail past a creek and some day hikers gazing at both ibex and a couple crazy mountain bikers high on the green rocky valley walls. The Prafleuri basin below the cabane. 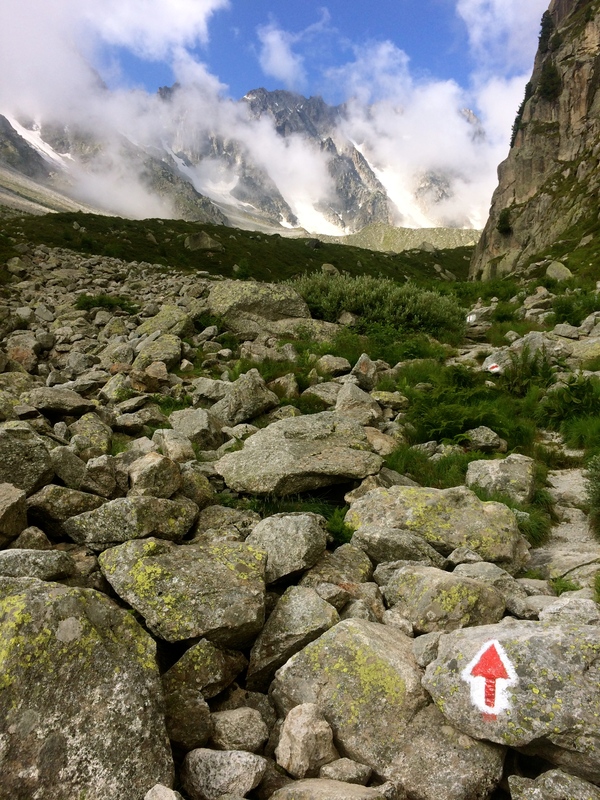 The steep hike up the basin spat us out directly below the cabane – we totally missed the Col des Roux but still made it to where we intended. 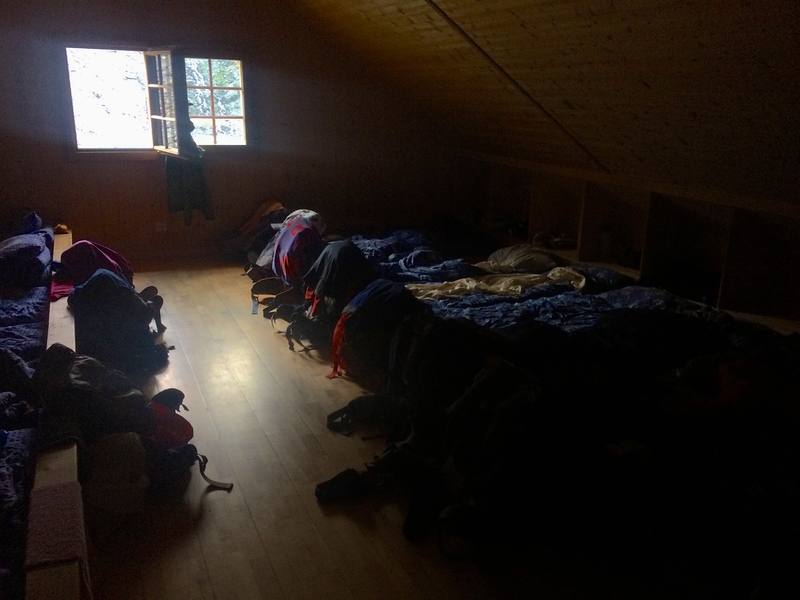 We were happy to find two open beds as an alternative to camping in the barren industrial alpine landscape of the hut. 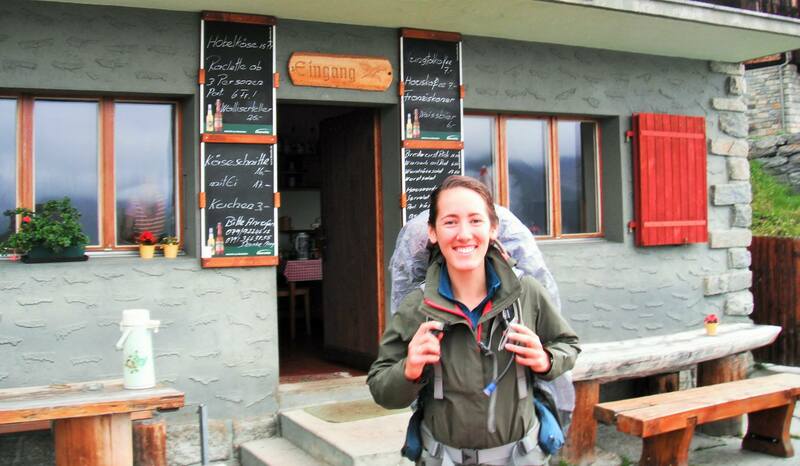 The lodge was full of hikers of all kinds, and we were definitely the odd ones out as we only payed for beds not meals. We enjoyed our bread, cheese and pepper sausage in the corner while a family style meal compete with wine was served to the 40 some guests around us. The night for the two of us was a reasonable 55CHF which included one community bathroom and a sleeping matt with cubby, pillow and comforter. We packed in with everyone for the night and enjoyed the oddity of bunking in the high mountains with such a diverse group of people. 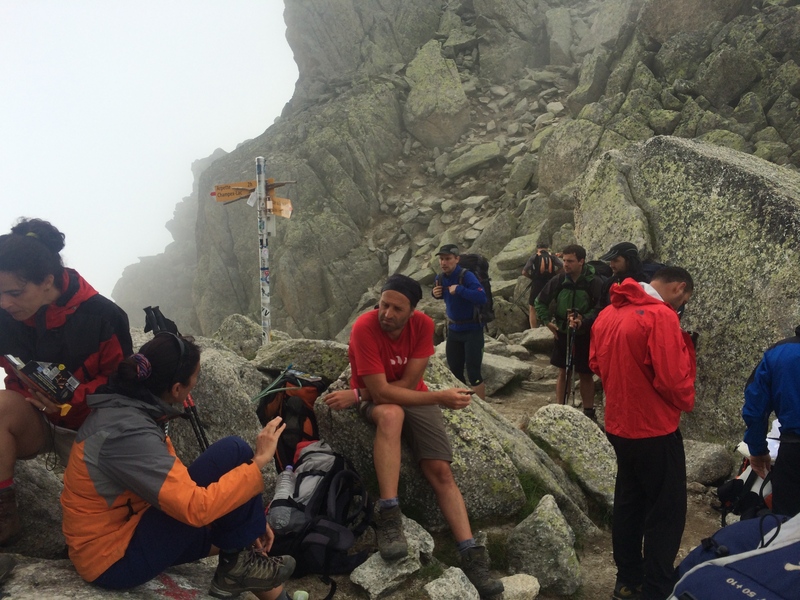 – Reserving beds/meals ahead of time would be smart, especially for weekends since there isn’t really a great alternative spot for the night unless you want to hike back to the Cabane de Barma. – The water at the hut is not potable so you either have to buy a 2L bottle for 7CHF or chance the creek water just down the hill from the hut. I was thrilled to try out my new water filter so in good cheap’o fashion we enjoyed ice cold mountain water for the evening. We also heard word that one could probably get away with just drinking the water straight from the streams since there is no livestock at that elevation. Waking to beautiful weather, we started our day as all our fellow sardines packed up and headed out. 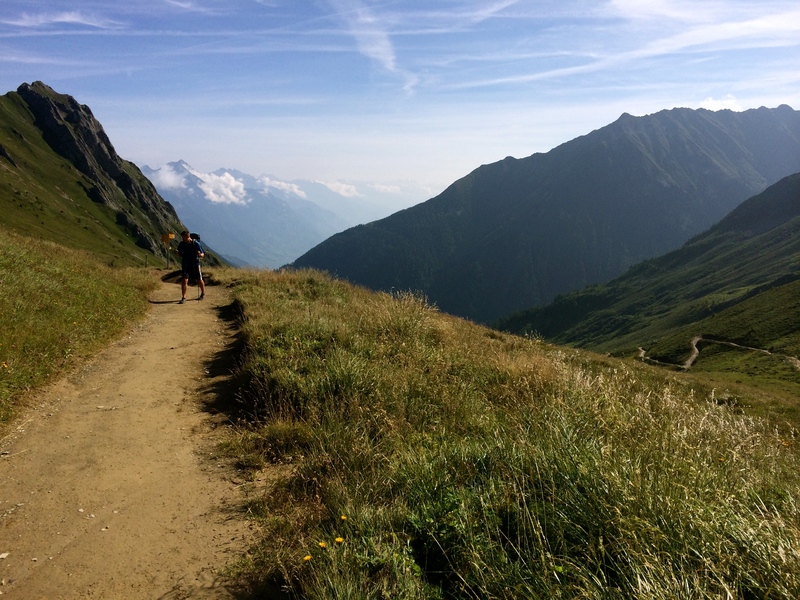 On the trail at 7:45am, after filling up on water from the creek, we made a quick ascent of the Col de Prafleuri with another British family. The surrounding peaks to the east gave hints at what our views of the previous day could have been without the clouds. This is the start of a day above 2000m with three passes ahead of us, nothing but rocks and snow and turquoise ponds along the way. Again there were more blazes and cairns than you could shake a stick at, so even with the vary minimal route planning and simplicity of our guide book map, we had no problem figuring out the trail while in deep distracting conversation. Also, following the yellow signs provided remarkably accurate time estimates and we did many sections of the trail in pretty clean 1-1.5hr chunks. The way to Col de Louvie traveled over relatively flat rolling piles of rocks with creeks, small snow fields, and ponds dotting the way, and we reached the summit of the pass after scrambling up a fun gully and snow field in time for an early lunch. The wind was chilly so we went on our way after basking in the sun and stunning western view. Our departure timing was perfect as we passed several large tour groups coming up as we went on our way down the pass. Gotta love having a summit to yourself before the hordes arrive. A short steep descent brought us to the cross-roads for the Col Termin and the Col de la Chaux. The trail leading up to the right was marked as an Alpine Route with blue and white blazes rather than the yellow we had been following. 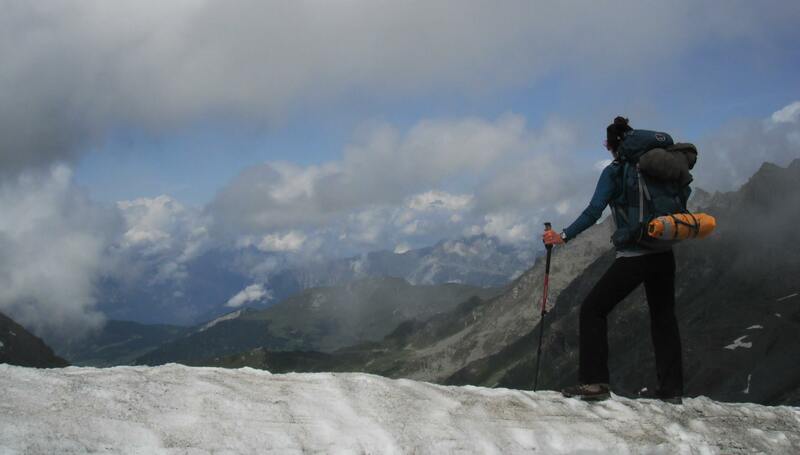 Alpine Routes are more dangerous and difficult with rock scrambling and glacier crossings. The guide book did not mention this as a more dangerous trail, though maybe a more difficult route than anything else we had encountered. And, it is significantly shorter than the Col Termin that loops out around the peak. 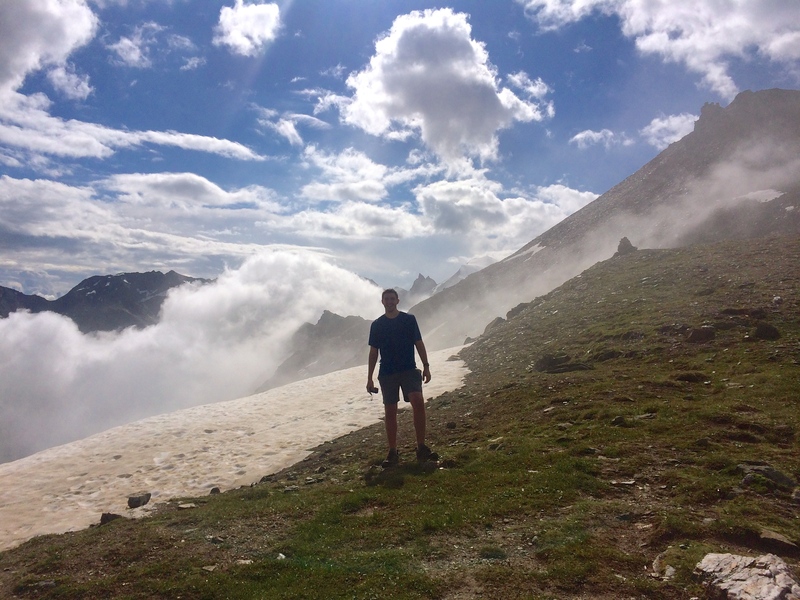 Our confidence took us up the trail past a stunning alpine pond and through a rocky basin, before we scrambled up glittering silver shale to the saddle of the Col de la Chaux. 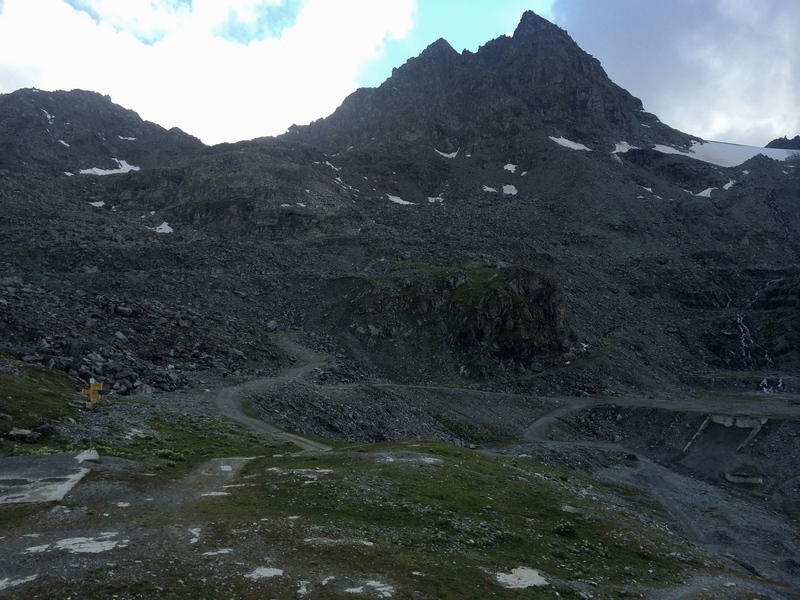 From here the main descent toward Cabane du Mont Fort would be entirely snow, until we hit the gravel road. I suppose I can understand this pass as an Alpine Route in certain conditions and times of year. The rock heading up was fairly unstable, and if it was colder, the snow on the descent would have been too steep and slick to kick steps safely without crampons and an ice ax. We enjoyed the easy hour trek down under the cable cars and by the mountain bikers to the cabane perched above the valley. From here we planned on making it down to Le Chable to catch a train to Champex for the night, but we had the options of making the 2000m descent into the valley by sore feet or cable car. We chose the latter and followed the yellow signs to Les Ruinettes. This traverse took much longer and required more mental effort than it should have. The trail runs along the grassy ridge parallel to a bisse (manmade creek/waterway) for an hour from the cabane, and you cross ski slopes dotted with picnickers, paragliders, and bikers until you round a corner to see the modern marvel of a gondola shuttling people up and down the hillside. 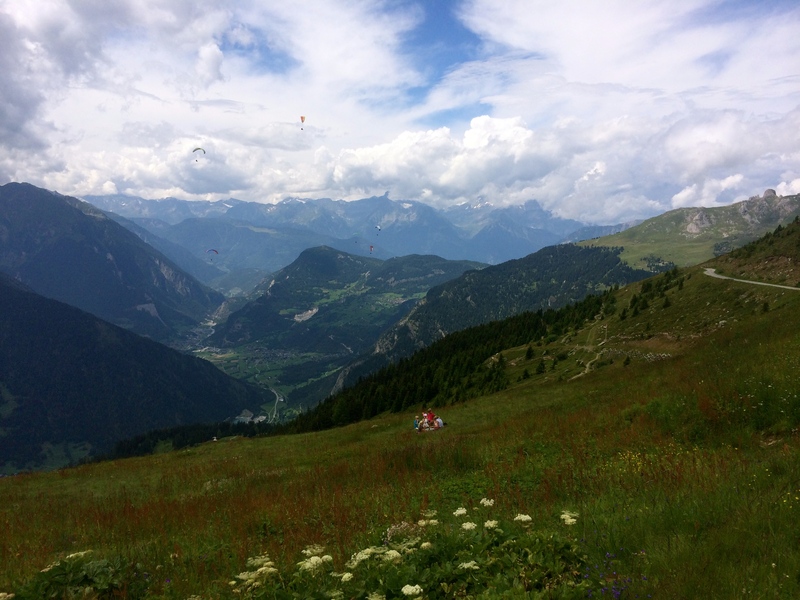 For 20CHF each we hopped on and road past Verbier right to the train station in Le Chable. 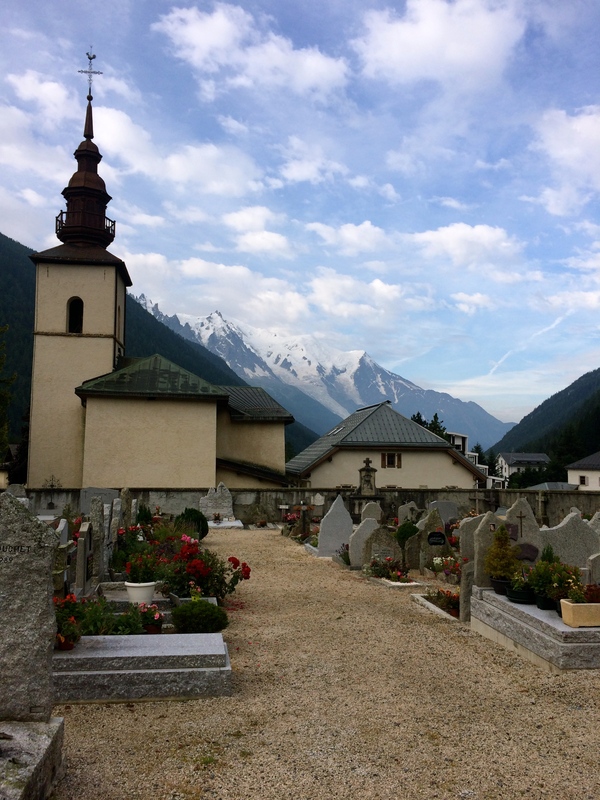 A short walk up the hill, we found an ATM and grocer to reload, and then enjoyed the valley views to Champex by train to Sembrancher and Orsieres where we caught a bus right to the Champex campground. Grassy terraces next to a sizable bathhouse made for a nice campsite packed with tents of all sizes and groups of all nationalities. Though, I really could have done without the slugs. The night of the slugs! I awoke to slime trails of all sizes oozed all over my sleeping bag, sleeping bad and backpack. Somehow Ben avoided any contact with them. We packed up early and set off ahead of several larger groups, and we fell lock in step with some couples and a father-son pair farther up the trail. Leaving the campground in Champex, the route finding was not entirely clear as we made our way towards Arpette and then the Fenetre d’Arpette (our pass for the day). We found ourselves powering up a grassy ski slope before running into a herd of campers and mules coming down the road that allegedly led to Arpette. There were no clear signs so we just kept walking. About 30min up the paved winding road we came to a glen in the trees with touristy cabins and some cattle fields. Trailblazing through some electric fences we finally spotted our first blaze on a rock. With the father-son duo on our tail, we kicked it into a comfortable high gear up the beautiful valley full of rocks, creeks, flowers and a view to die for. 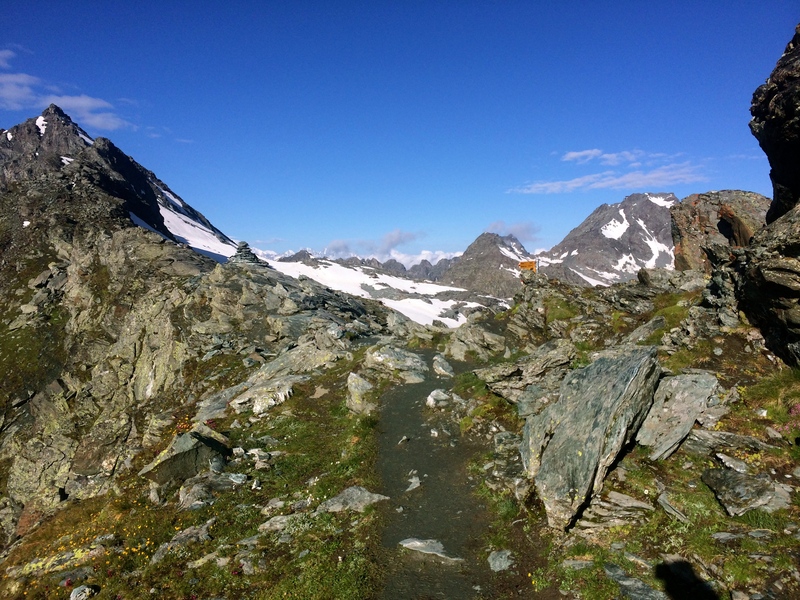 The trail was a well defined single track that meandered through green tundra, over and around clean white boulders as we gained elevation into the valley. The ascent was steady and steep and we found ourselves reaping the benefits of our back to back days of hiking with heavy packs. Strong legs burning with familiar exhaustion, we passed every person and group on the trail, keeping the increasingly impressive father-son duo at a safe distance behind us. Cresting the final boulder field of loose rock we made good use of our speed to avoid rock fall hazards by passing the last group of guys before the final couple hundred foot ascent of loose scree switchbacks. We took in the stunning view of the Glacier du Trient, and enjoyed another cheese and sausage lunch as the small rocky pass filled with hikers of numerous nationalities from both sides. I think we heard 6 different languages at one point. Clouds slowly engulfed us, and as the crowd grew at the summit, we got a head start on our descent before the masses started kicking rocks down on us. The descent is steep and rocky and we were glad for the stability of a trekking pole each. We frequently had to step to the side to allow passage of tour groups making their way up from Trent. 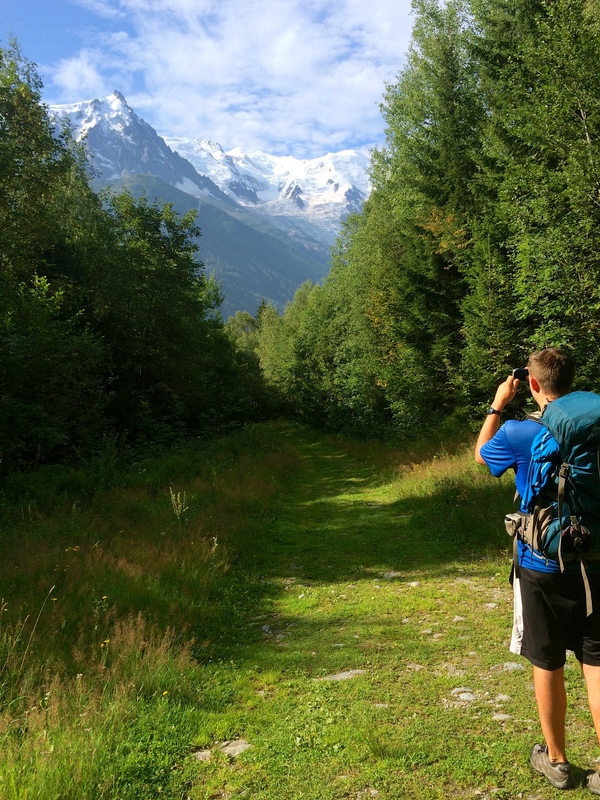 The trail is shared with the Tour du Mont Blanc and the traffic increase was very apparent as we made our way into the valley. Eventually, the sun came out and bathed us as we continued the long and beautiful route to Trent, only tampered by our exhausted legs. In Trent looking back up the valley – Pink Church..
Several hours brought us into the pleasant valley of Trent, first passing the Chalet du Glacier (a potential stop for refreshments), then Le Peuty where the campsite is, and finally the walk down the quiet road where we spent the rest of the afternoon enjoying Swiss beer and ice cream at Le Cafe Moret. The campsite in La Peuty is just as the road turns to gravel and there is a barn like lodging for non-tenters and a public bathhouse and pavilion complete with large fire grill. We set up camp in the evening sun surrounded by Swiss and Chinese expeditions, and the night only cost us 8CHF. And not a single slug. We rose early to the noise of our neighbors packing up and heading out. I felt refreshed after 12hrs of much needed sleep, but with still tired legs the initial switchbacks 1000ft up the valley wall were a challenge only made tolerable by Ben’s steady pace and the thrill of passing every single hiker from our camp. Once we reached the open ridge our final meandering climb of the trip laid out before us. 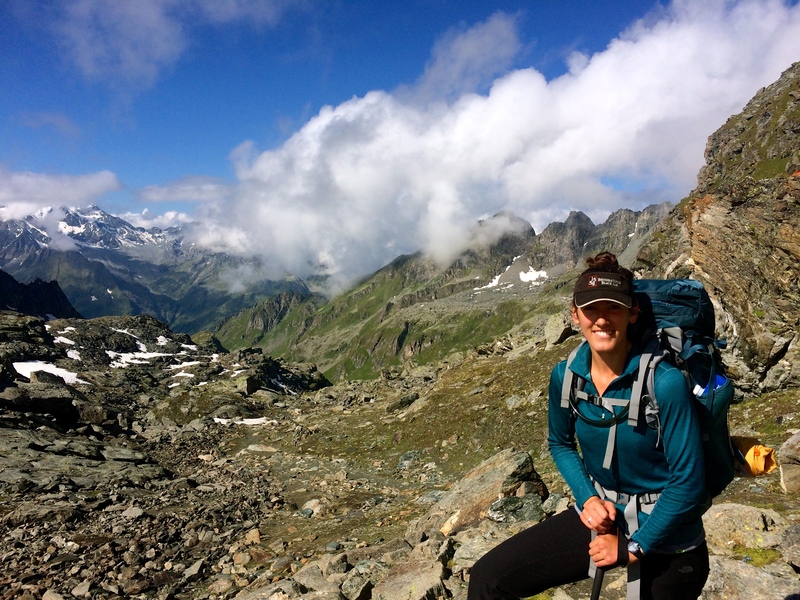 We found joy in the sun and open trail as we marched on to the Col de Balme. The wide grassy saddle cradles an old Chalet on the French/Swiss border where we feasted on bread, cheese and sausage while watching assorted nationalities stage goofy photo ops. The French valley before us is framed by the great snowy Mount Blanc Massif and the jagged cliffs of the Aiguilles Roughes–a stunning view. We spent a great part of the morning taking it all in before our final descent into Argentiere for an early pizza and beer dinner. The trail into town takes you through a popular ski and mountain biking resort with a gondola down as a leisurely option. This was the only time we decided against the ride. Once off the slopes it could be a short bus ride or a lengthy walk down the road from Le Tour. We ended up just walking down the paved road because we couldn’t find any clear signs to the trail. One should take a left (east) out of town on the Chemin du Rocher Nay which connects to the trail that runs up the ridge from the river. After enjoying food and drink, we went on the hunt for the campground. With sore feet, the wandering was not appreciated, and we finally walked back up the road about half a mile to find the Camping Pierre Semard campground tucked away on the western slope of the valley. 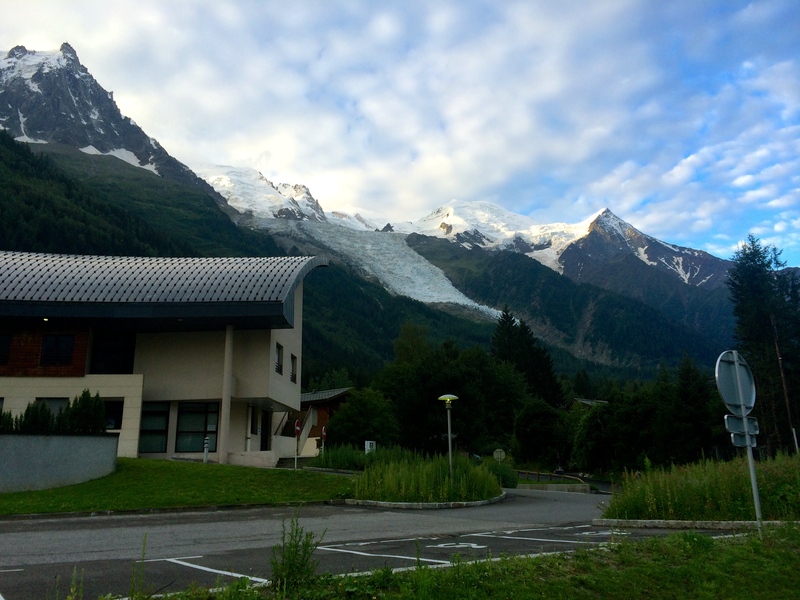 Apparently there is also the Camping du glacier d’Argentiere on the south eastern edge of town. We set up on the outskirts of the lawn and enjoyed a relaxing evening of yoga and reading before being graced by a second fireworks show to carry us into our final night of tenting slumber. With our last night of tenting behind us, we got an 8am start back down the trail for our final stretch into Chamonix, France. This final leg of the journey is a leisurely valley walk for about 8 miles between the towns, along the hillsides, and through the city streets. 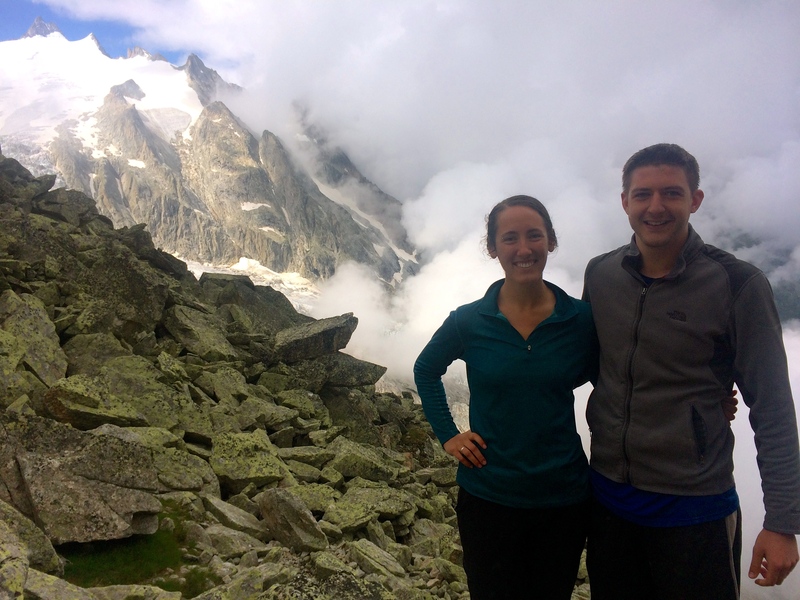 We finished off our granola, Nutella and yogurt on an Argentiere city bench, before searching for the questionably marked trail signs to Chamonix. 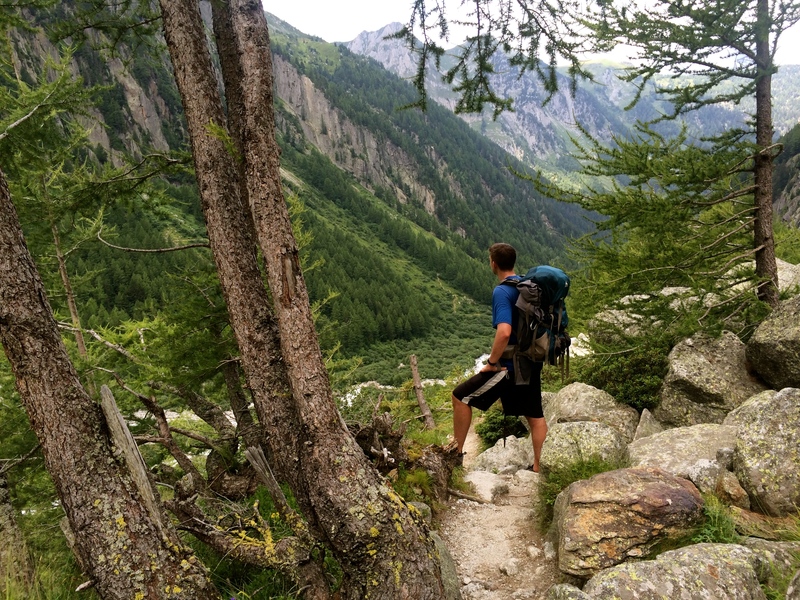 Walking south along the main street in Argentiere, we hit the railroad tracks and headed right up onto gravel road that parallels them before it turns into a trail up on the western hillside of the valley. The forest walk is quite pleasant, and our laden march was accompanied by many runners, dog walkers and families enjoying the peaceful path. In the barely three hour walk, our conversation wound and flowed with the rolling and winding of the trail through parks and streams, over roots and under green canopies. It was a calming and rich hiking conclusion to our trek across many mountain passes. Eventually, we come down a hill onto a street. Here, we wandered around a bit trying to make sense of the guide book and various signs. We figured out that we had to cross the road bridge over the river and head south on the Prominade des Econtres which parallels the L’Arve. 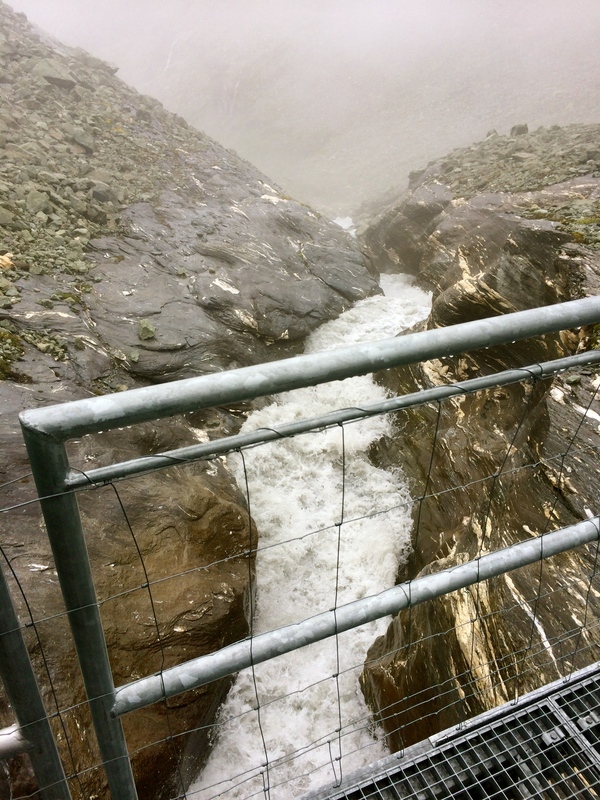 This rushing glacial melt river slides by as our path skips across roads for almost a mile before T-ing at the Prominade des Foui which takes you into north central Chamonix. We arrived in town around lunch time. With the whole day ahead of us and the trail behind, we wandered the busy streets looking for a bank, potential sites to see and eventually a welcoming picnic spot. Once again relying on my trusty iPhone GPS, we wound our way through the massive sports complex near the Prom. du Fori and found a public park nestled north of the reservoir where loads of paragliders land. Here we lounged the afternoon away, reading, eating, napping (getting sunburned) and people watching until we were ready to journey across town to our reserved room at the Mountain Highs Chamonix Hostel. We probably could have figured out public transportation to get there, but we were experts at walking by now, so we meandered through the streets for another hour before locating the quaint and friendly hostel tucked away on a southeastern gravel road. We had reserved a private room here via Hostelworld.com when we bought our plane tickets and planned our transportation. It was an excellent choice for 35 euros/person for a private room with a shower and great communal amenities that we sadly didn’t have time to take advantage of. If I’m ever back in Chamonix I would love to stay here for multiple days. 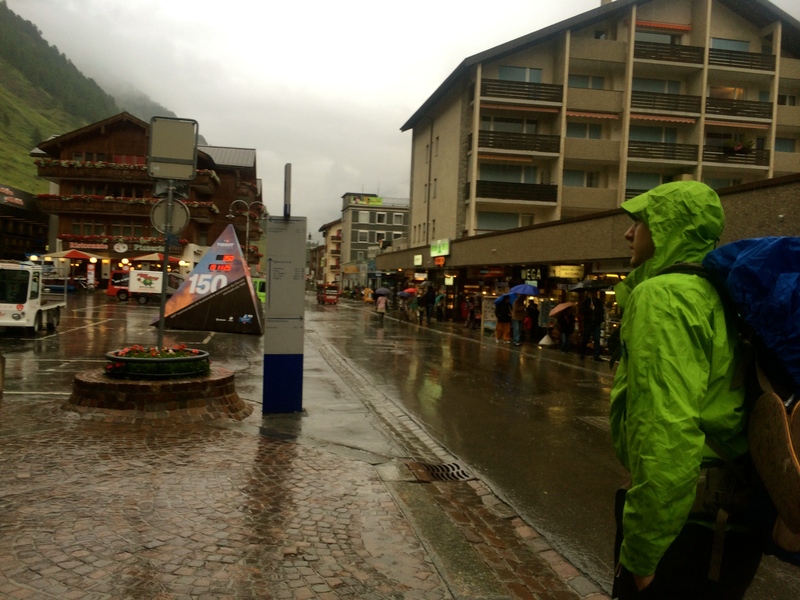 After showers and more resting/reading, we walked around the bustling streets and shops of Chamonix in the evening. 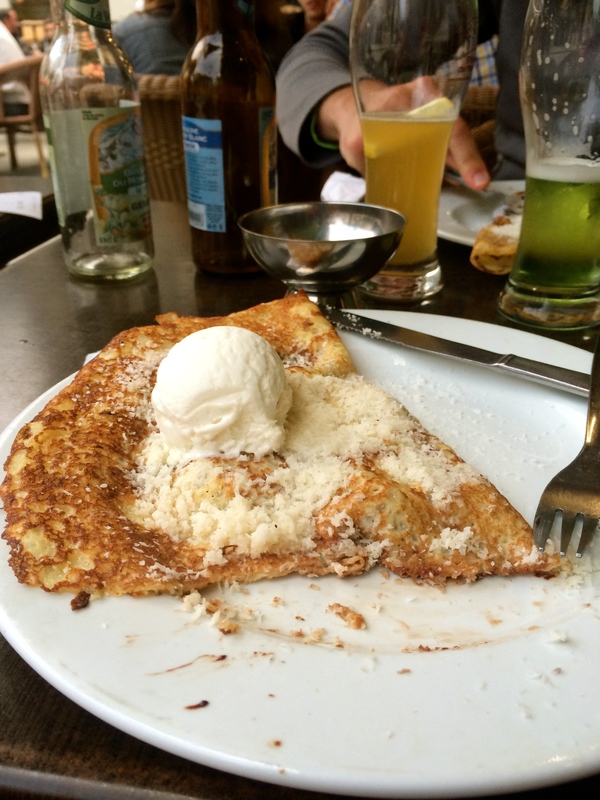 We chose a main street cafe/pub to enjoy some funky French “beers” and one hell of a rum crepe. 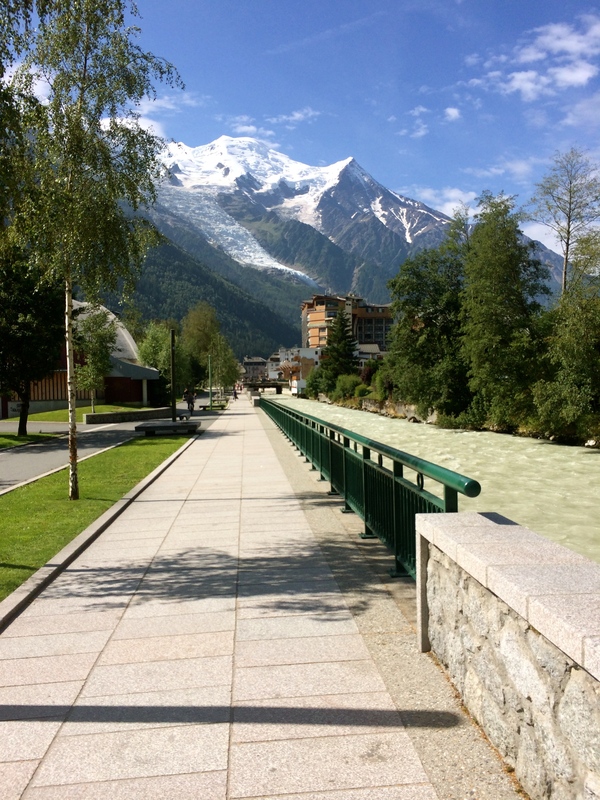 Chamonix felt a lot like Colorado’s Breckenridge, Aspen, and Boulder all smooched together at the foot of Mont Blanc. All throughout Chamonix, outdoor and adventure culture is inextricably paired with the shameless commodification of mountain environments and activities. The streets are lined with boutiques filled with high end equipment and fashion, the mountain sides are striped with gondolas and ski slopes, and the air is sprinkled with sky divers and paragliders wafting down from above. Ready for a 6:55am pick up, we packed up and walked to the nearby hospital to wait for our shuttle ride to the Geneva International Airport. We scheduled our transportation through Chamexpress.com based on our plane departure times and for 52.18 euros the two of us and our two bags had a tight but comfy ride straight to the airport from the pickup location of our choosing. It could not have gone more smoothly. We spent our remaining euros in the airport on coffee and chocolate and Ben’s long awaited New York Times. 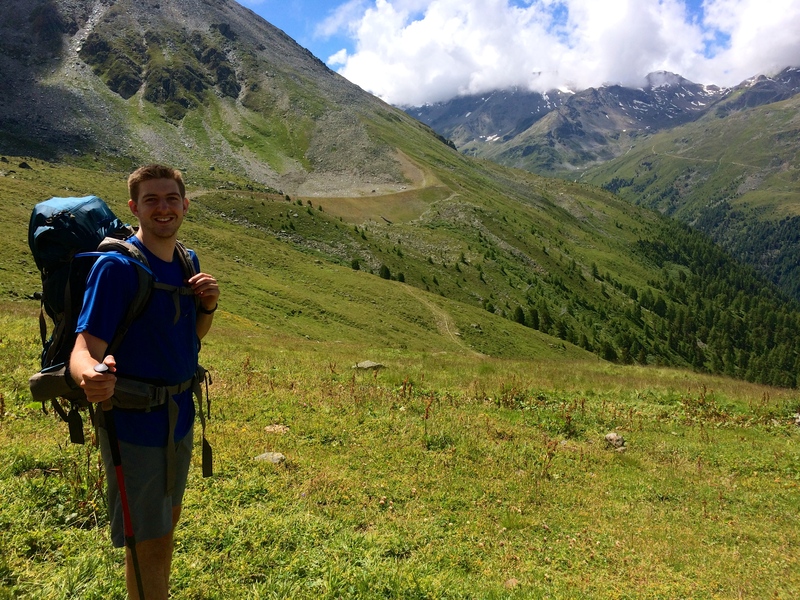 We said our goodbyes and spent the plane rides back to Colorado for me and Athens for Ben dreaming of future alpine adventures sure to come. Go and hike! I still pinch myself in reminder that my Alpine European adventure on the Haute Route was a reality. The trail time and grand views were all well worth the effort and time spent planning and packing. I spent the better part of a year looking forward to a vacation that took more energy and work than everyday life. Not everyone’s ideal, but if you enjoy hauling yourself over mountain passes for days on end, then planning a trip in the Alps is definitely a great vacation option. Don’t let money or time discourage you! The trail system was so impressive with resources and options for all ability levels and interests. I certainly look forward to more treks. Next, are day hikes in the Dolomites, the Tour du Mont Blanc, and heading up the Matterhorn :) Though for 2015 I’m just looking forward to logging some Colorado trail time in the San Juans. Stay tuned!